The first half of Thursday was uneventful, but the second half made up for it. I worked on the post for Wednesday until about 2:00 pm and then started getting ready for the day. 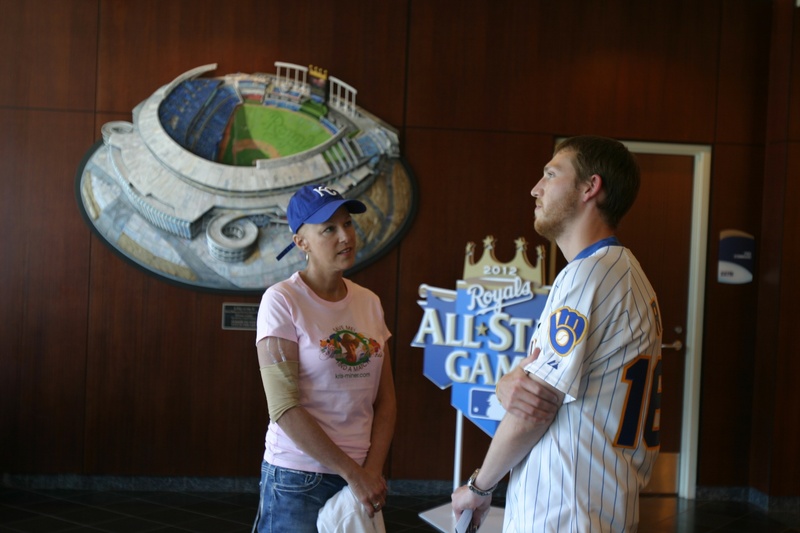 I was going to be meeting Kris Miner, a Kansas Citian, who is in need of a bone marrow transplant and doesn’t have a match. Her family is promoting Be The Match and trying to find a match for Kris. 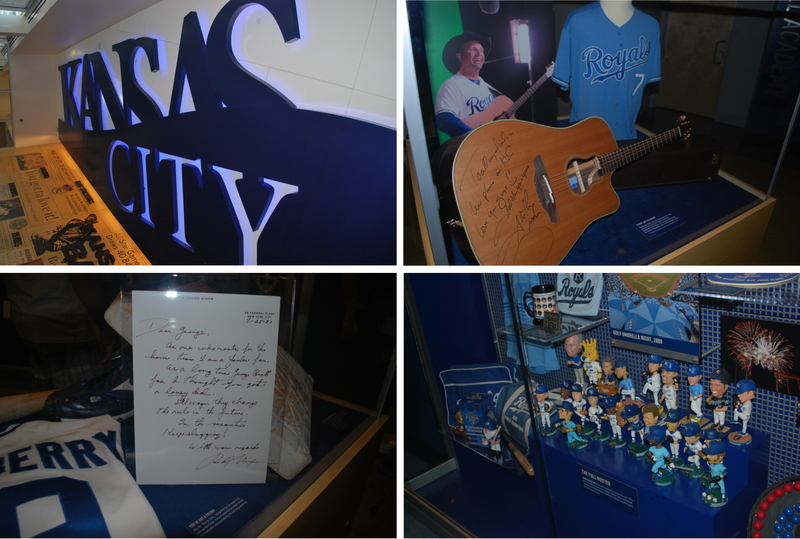 I agreed to meet with Kris at Kauffman Stadium on Thursday to do a few TV spots for Fox Sports and a couple local news stations. 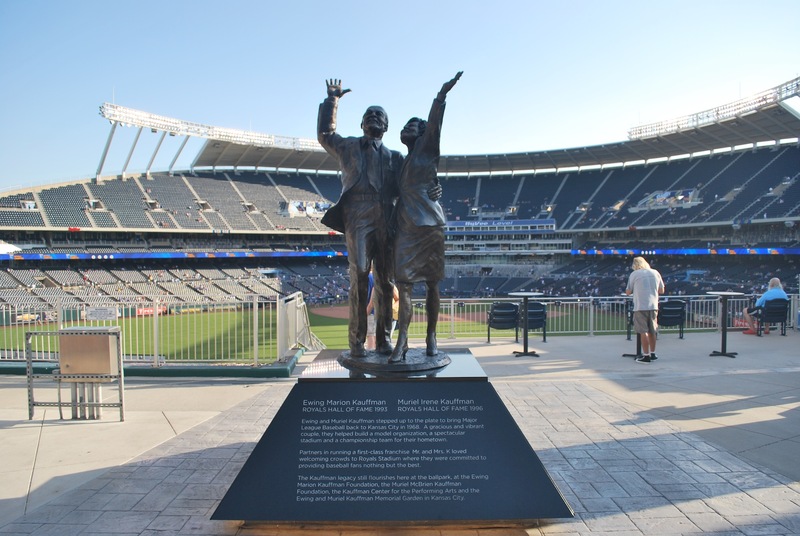 I left Tom and Danielle’s place at 3:18 and got to Kauffman Stadium just after 3:30. Apparently if you get there early enough parking is free. They have toll booths set up where you pay for parking, and all but one of them had a cone in front of the lane that you drive through. The farthest one to the right didn’t have a cone and I proceeded to park in the A lot. There was an attendant nearby, and after parking (there were a bunch of other cars parked as well) I asked if I just pay her. She said no, and that I got there early enough and didn’t have to pay. Uhhhhhh, OK!!! 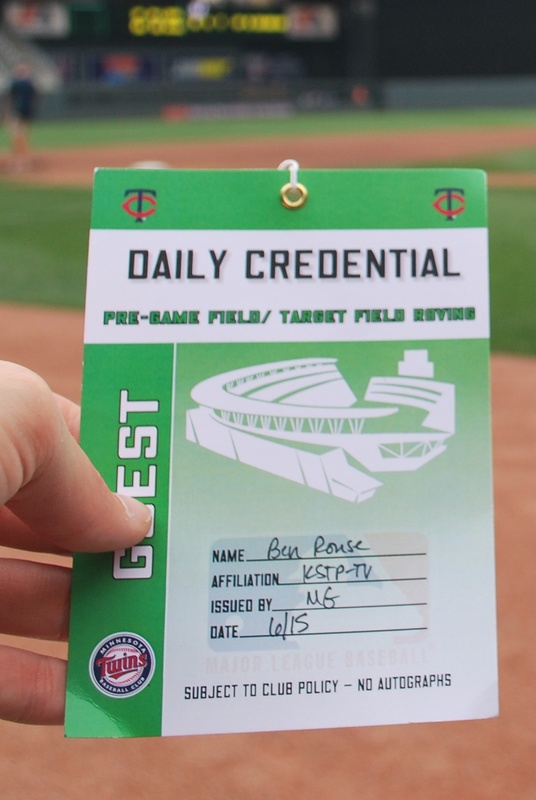 I put my pass from the previous day on the dash just for good measure and made my way to Gate C, where Erik Miner (Kris’ brother-in-law) told me to enter. They weren’t there yet and the guy manning the door didn’t know what I was talking about so I just waited for everyone else to arrive. 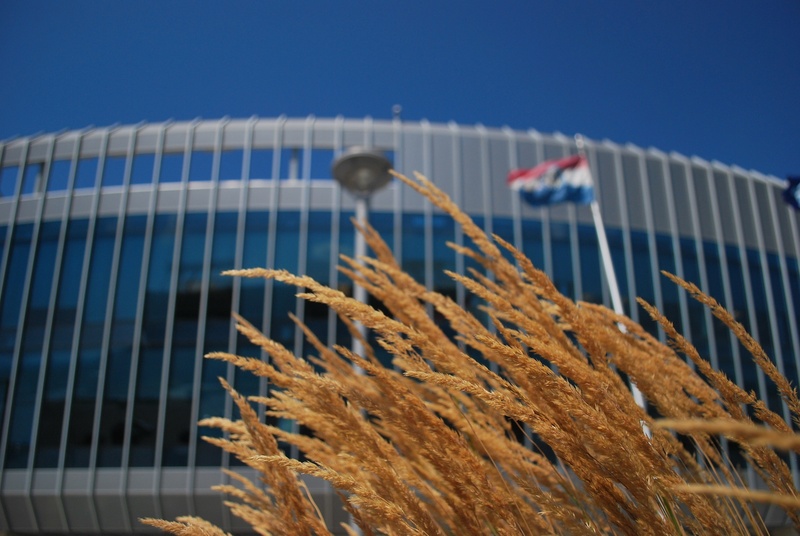 In the meantime I took an artsy shot of the exterior of the home plate entrance, with some wheat-like vegetation in the foreground. When team Kris Miner arrived we entered Gate C and congregated in the lobby while the details for the TV spots were worked out. Kris and I talked about our experiences while we waited for the interviews. She is getting an aggressive chemo regimen 24/7 to try and suppress the Lymphoma until she can find a match. After about 15 minutes we entered the Diamond Club behind home plate and got situated. 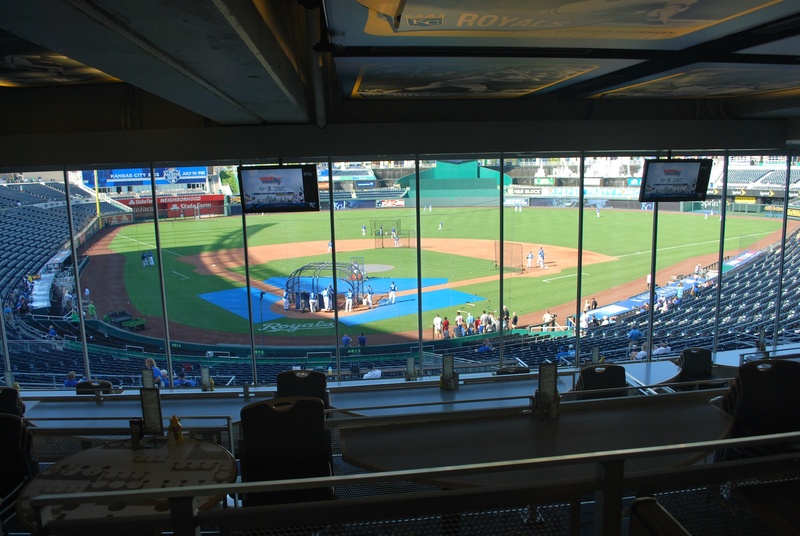 When the Royals were taking batting practice I took a picture from the restaurant. 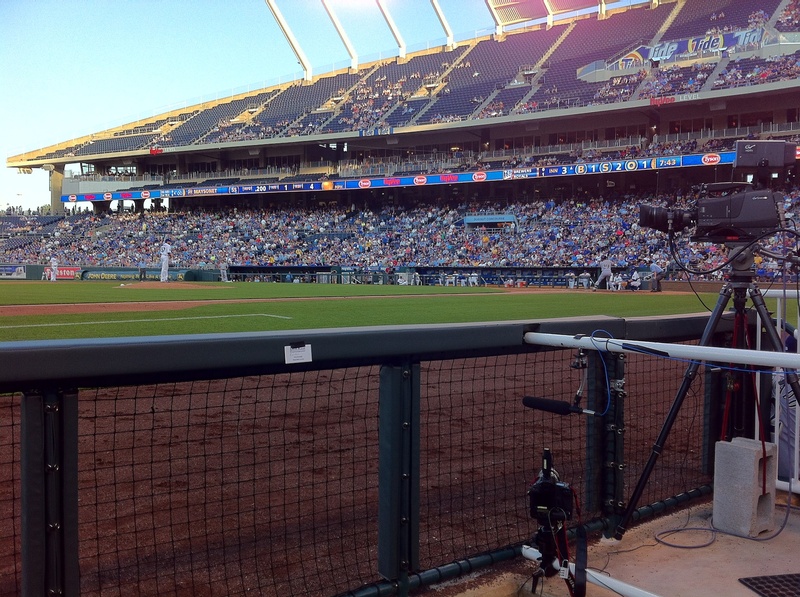 Kris and I eventually got seated and Nate Bukaty (from FSN) sat between us. I had actually done a radio interview on Wednesday with Nate, as he also co-hosts the morning sports talk show on ESPN Radio’s Kansas City affiliate. I had a few hiccups, but overall I think it went well. The audio is a little tinny, but it will suffice. This aired during the Royals pre-game show. Erik took pictures during the interview and here’s one that I picked out. After the FSN spot we did a few other short interviews for a couple of the local news stations (thus the microphone clipped to my jersey in the photo above). Kris and I posed for Erik after we were done with the media. It almost brings tears to my eyes thinking about the situation Kris and her family are in. I was in the same boat three years ago and was bailed out by a couple of matches in the umbilical cord blood database. The doctor’s gave Kris 7-9 weeks without a transplant. She is an amazing individual who understands that even if a match isn’t found for her, she is still helping out others. What we’re trying to do is prevent people from being in the situation where the clock is ticking and there isn’t a match. Check out bethematch.org and find out how easy it is to join the registry. I said it before, but there is a drive in Madison on June 21st, and another in Milwaukee on June 27th. You can also order a kit online to do the cheek swabbing at home. 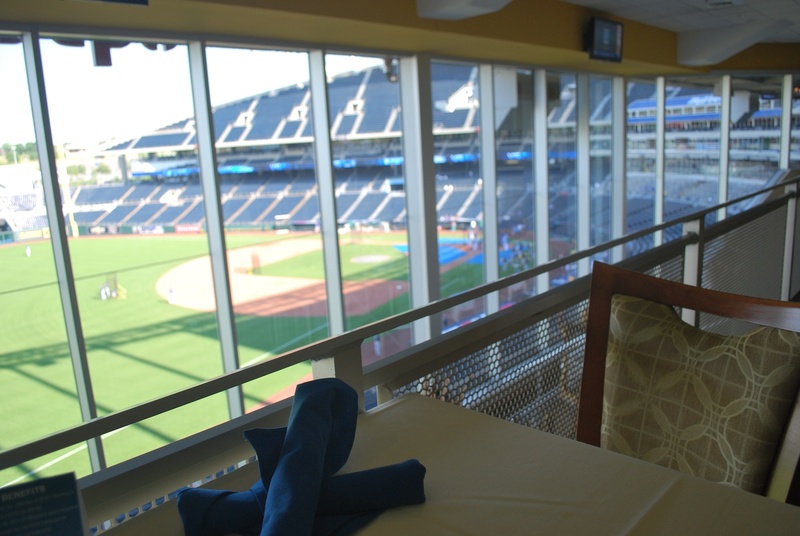 We left the Diamond Club and went up to the .390 Bar & Grill on the second level of the stadium. 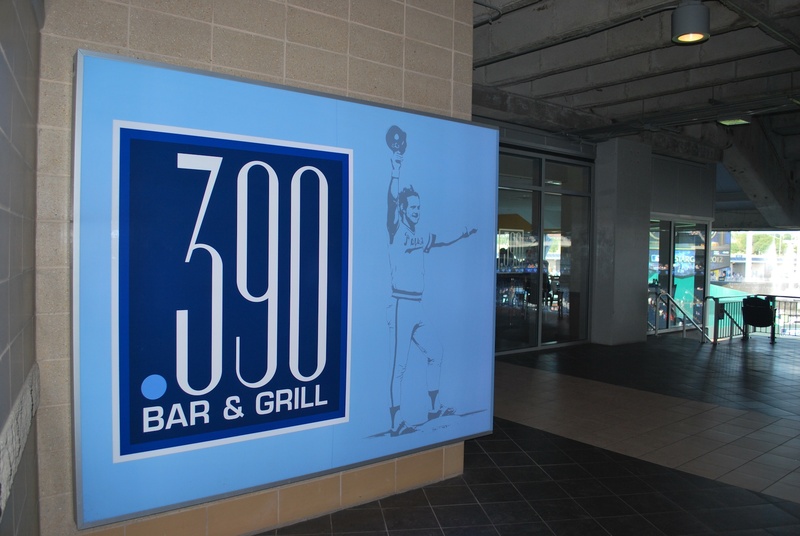 George Brett hit .390 in 1980, thus the name of the restaurant. 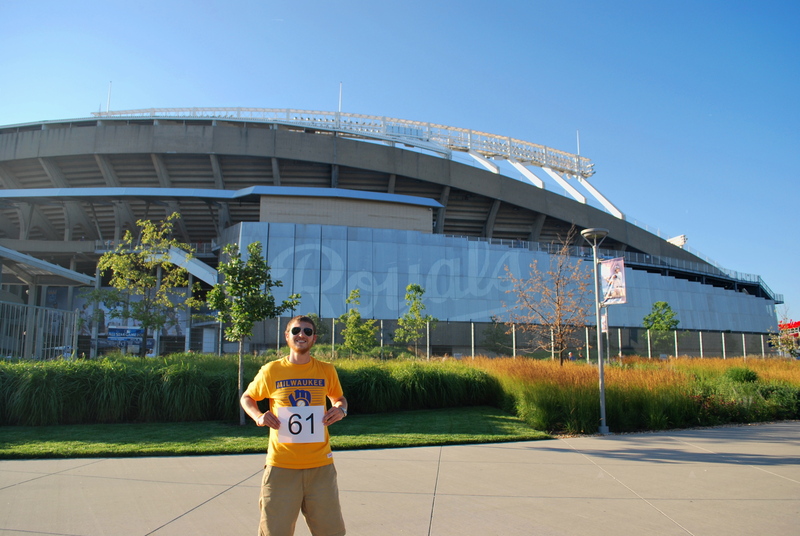 They started taking orders around 5:30 and I had a co-worker of Erik order for me as Erik and I went to the upper deck to get game photo number 63. It took a bunch of tries to get a decent picture. It had nothing to do with Erik and everything to do with the sun and the problems it was causing. 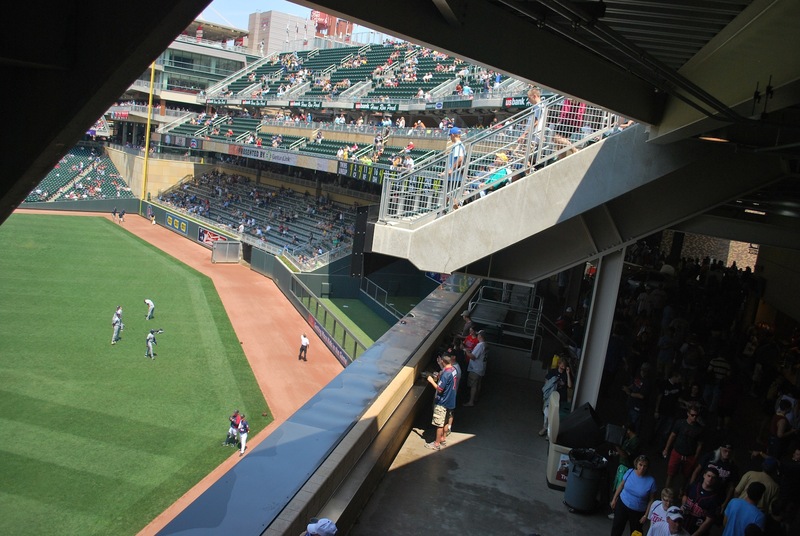 The sun was just showing throw the gap between the stands and the roof of the upper deck. We had to find a spot where the sun would illuminate me and the sign otherwise I would have just been a shadow. 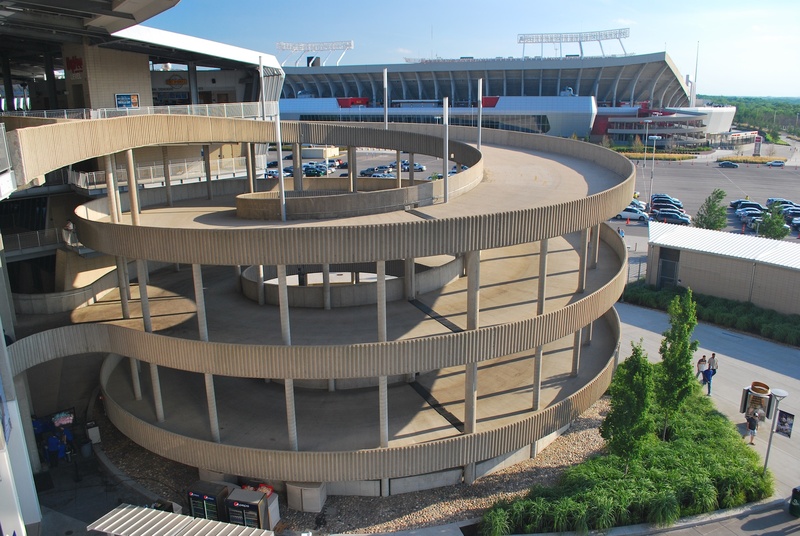 On our way back to the .390 Bar & Grill I took a picture of one of the spiral ramps that is connected to Kauffman Stadium. It doesn’t make for a very pretty exterior, but they need ramps, and this was the style in use when the stadium was built. 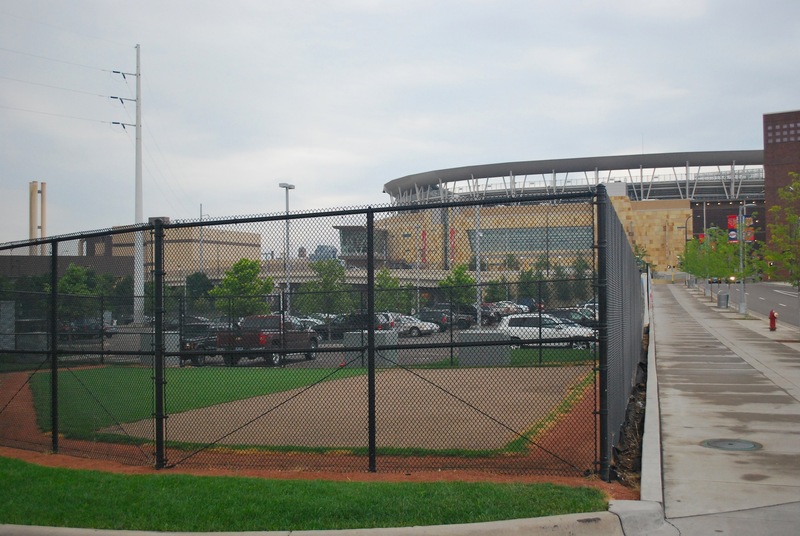 Arrowhead Stadium can be seen in the background, where the Kansas City Chiefs (NFL) play. When we returned to the restaurant this was waiting for me. 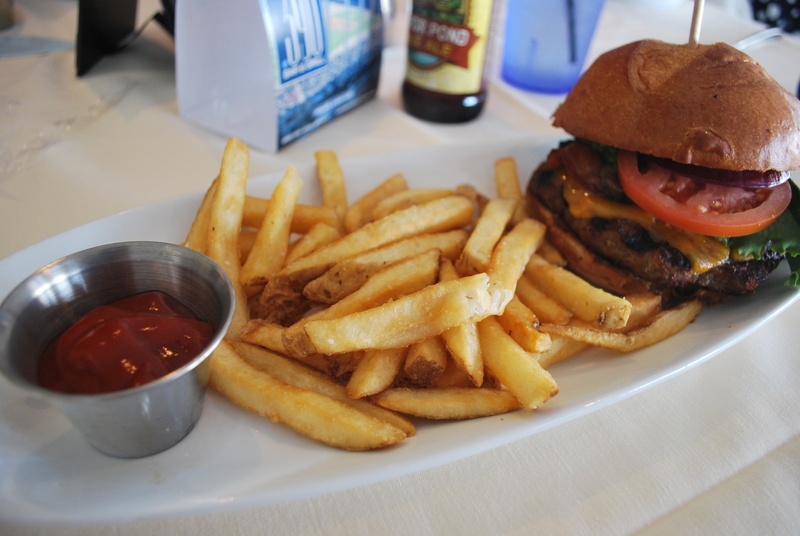 I ordered the build-your-own burger, and put on lettuce, tomato, onions, bacon, cheddar, and mushrooms. It was going to set me back $15 but Erik graciously offered to pay. He said it was for helping them out, but it was the least that I could do to raise awareness for something that is so important for Kris and many like her. The view from the .390 Bar & Grill is pretty good, but the beams are a little distracting. If you’re in the seats right up against the glass they wouldn’t be a problem though. We stayed in the restaurant until after the National Anthem, and then headed down to our seats. I thought we all were in 224, but I looked at my ticket and saw 234. Apparently the Royals only had 8 together in 224, and then the rest were in 234. I still just sat with Kris, Ken (Kris’ husband), Erik, and some other family members in section 224. 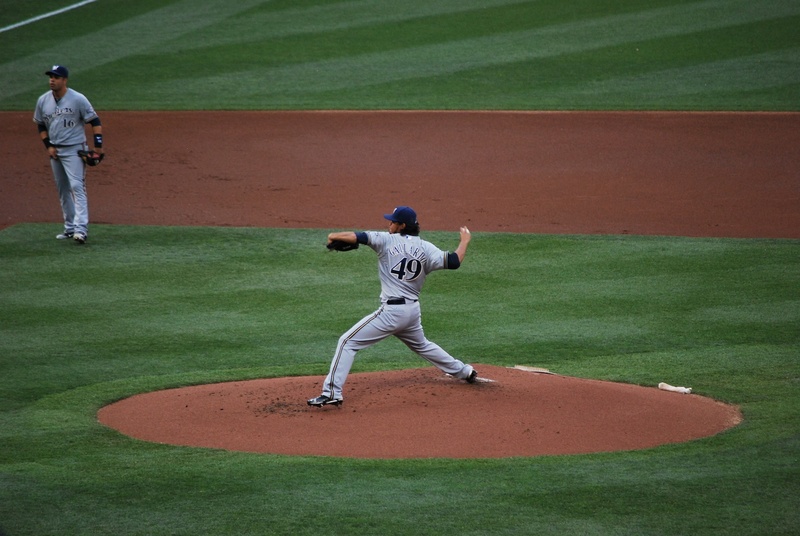 Marcum was on the hill for the Brewers, and he pitched a great game. Here he is delivering a pitch early in the game. The game was knotted at zero heading into the fourth, and that’s when Braun went deep to give the Brewers a 1-0 lead. Apparently he didn’t want his picture taken, as he shielded himself from my camera as he rounded second. Ok, he actually was making sure his helmet was on tight, as he routinely does at least once during his home run trot, but it’s fun to imagine, isn’t it? 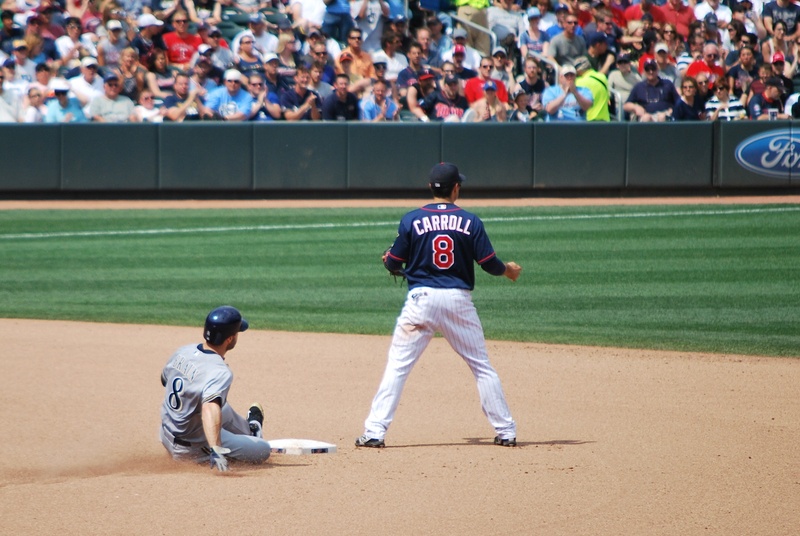 In the bottom of the fourth the Brewers turned a 6-4-3 double play, and I captured Rickie as he was making the turn at second. 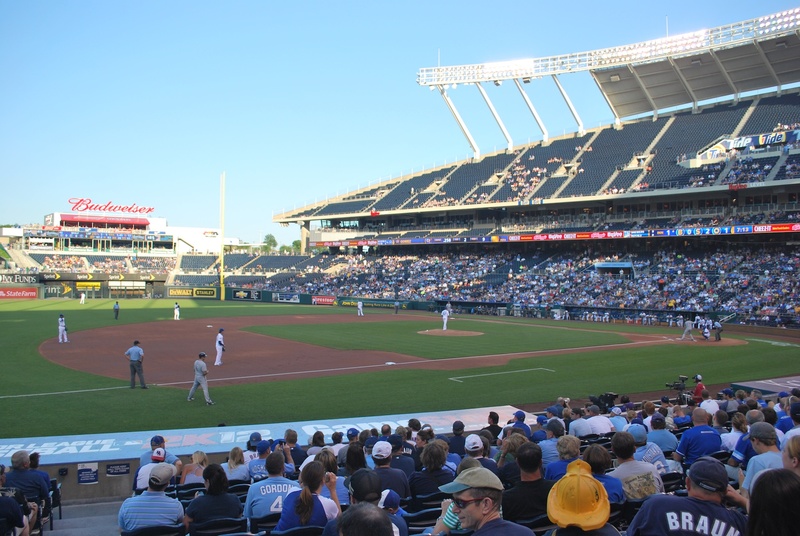 In the sixth inning the Royals took the lead on a two-run home run from Eric Hosmer. Hosmer is on my fantasy team, but I honestly don’t even know if I was playing him, as I haven’t checked my lineup in 10 days or so. 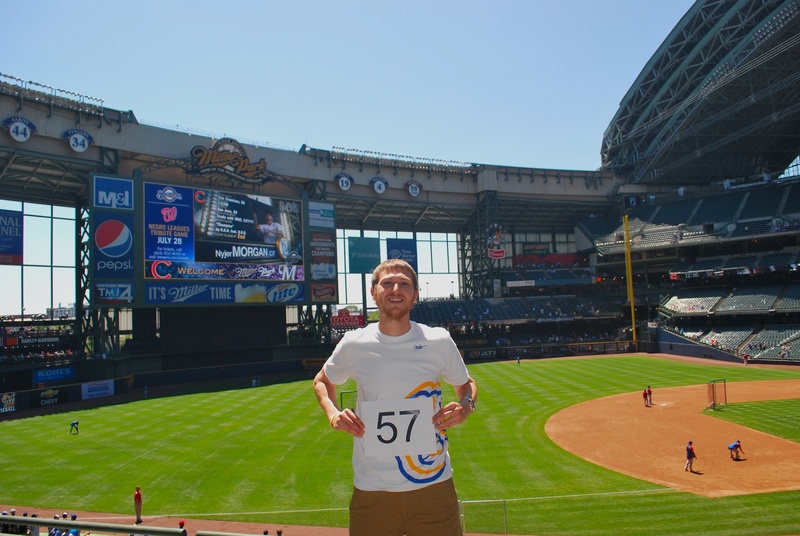 Either way, I’d much rather see the Brewers succeed than my fantasy team, seeing that I have much more invested (emotionally and financially) in the Brewers than I do in fantasy ($25). 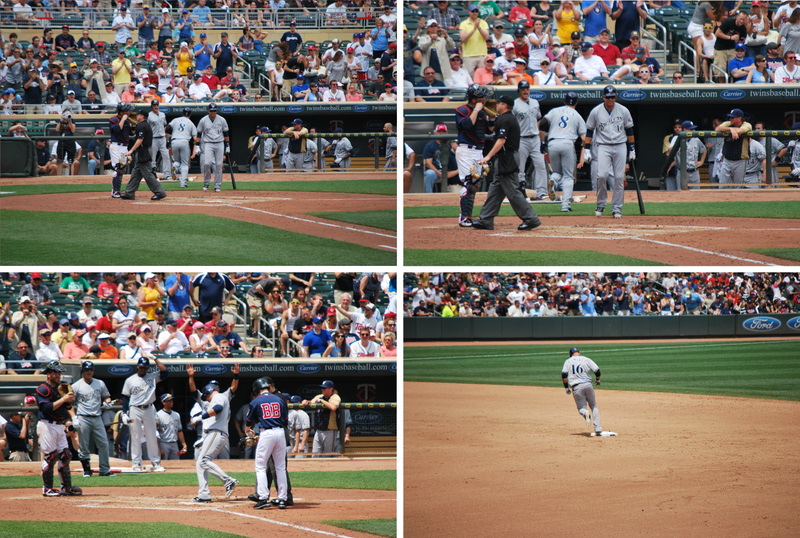 Aramis Ramirez tied it at two with a solo blast in the seventh, and I captured him as he stepped on third. Alcides Escobar looks on, as 3rd base umpire Dale Scott makes sure Ram-Ram touches the bag. In the top of the eighth the Brewers played some small ball and took the lead. Gomez singled, Maysonet sacrificed him to second, and Ransom drove him in to give the Brewers a 3-2 lead. Marcum pitched into the eighth and his final line was 7 and 2/3 innings pitched, 4 hits, 2 walks, 2 earned runs and 5 strikeouts. He was definitely deserving of the victory. K-Rod relieved him and got the last out of the eighth. 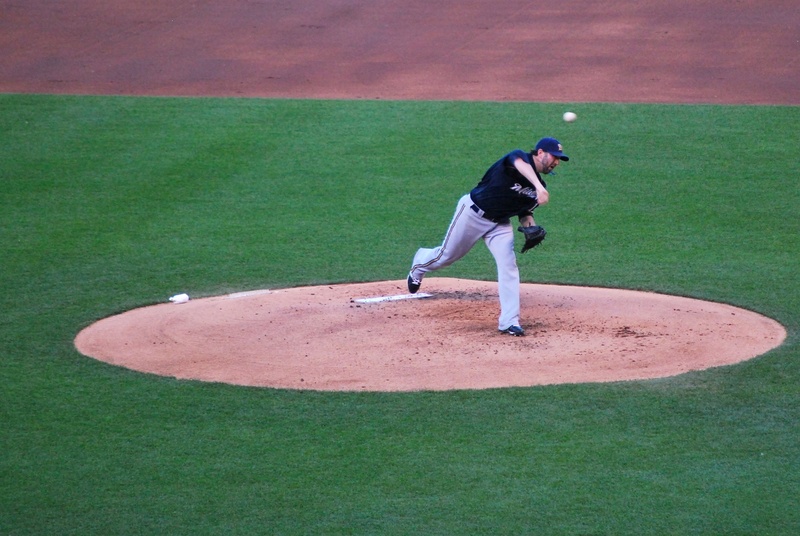 Axford came on in the ninth to try his hand at save number 11 for the second consecutive night. 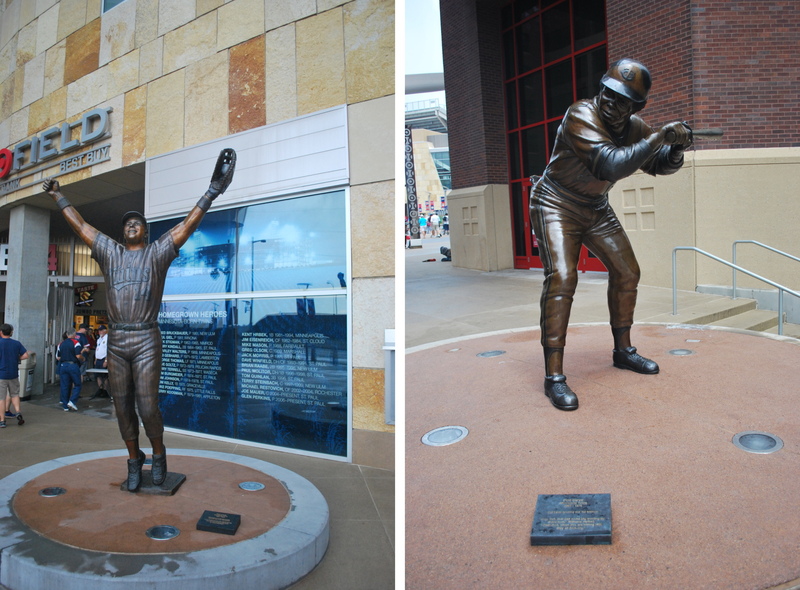 He struck out the first batter (Maier) but his curveball was a 57 footer and got by Maldonado. With the tying run on base Axford induced a groundout and struck out Escobar for what should’ve been the final out of the inning. Jarrod Dyson then drew a walk and the winning run was now on base. Brayan Peña lined Axford’s 1-1 pitch to left field for a base hit, and Maier scored easily. 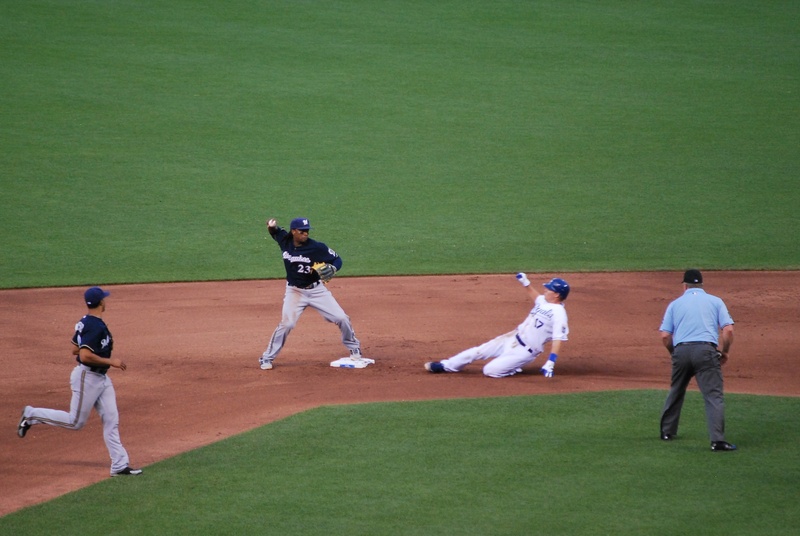 Peña had started going to second and the cutoff throw went to Maysonet (the Brewers shortstop). Maysonet then tried to get Peña and threw low to Rickie Weeks at second. In the meantime Dyson had taken off for home, and Maysonet’s bad throw to Weeks led to him not being able to get the ball home in time. Final Score: Royals 4 – Brewers 3. It was a devastating loss and I was speechless. I honestly didn’t see the winning run because I had turned my back when I saw the tying run score. I was preparing myself for another walk-off in the upcoming at bat or another extra inning affair. I don’t know if I would’ve seen it anyways because I was standing in the concourse and everyone was on their feet with their arms in the air as the Royals finished the sweep. I was planning on leaving Kansas City early Friday morning, but Thursday’s results made me reconsider. I was really down and figured I probably wouldn’t get much sleep anyways. 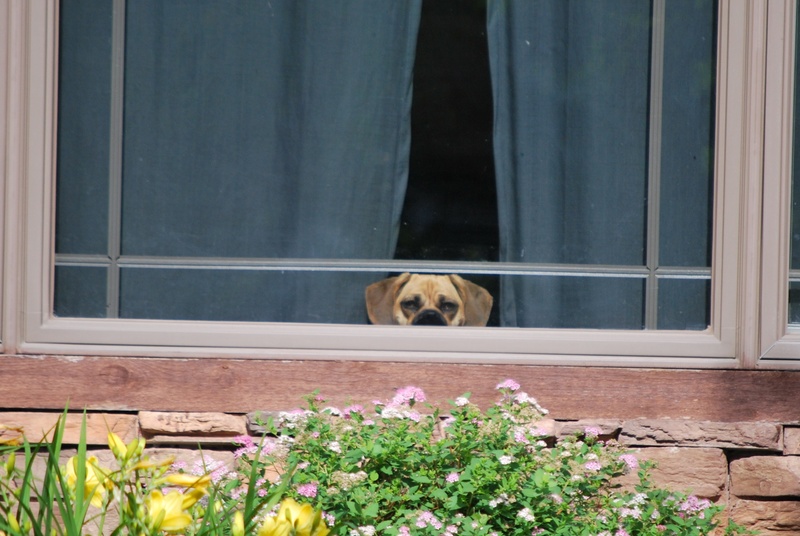 I went back to Tom and Danielle’s, packed up, said goodbye, and left their place at 11:36. I pulled up to Victoria’s friends’ place in Minneapolis at 6:10 and made it in just over six and a half hours. 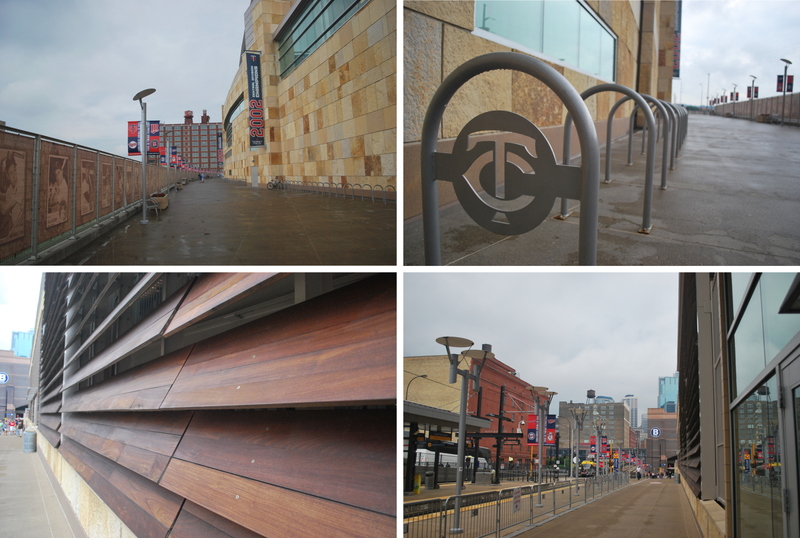 I’m leaving for Target Field in about an hour, and I need to get going. I’m doing an interview with a TV station at the park, and then meeting some Be The Match staff at an Irish Pub nearby. I just want to thank Team Kris Miner for letting me help out with their cause. Stories like hers make me realize that I made the right decision in regards to quitting my job and stepping up to the plate. They were all very nice and I look forward to her finding a match and making a full recovery. Before I forget; I taped the re-airing of the Brewers game from Sunday, and recorded with my iPhone the point in the game that I caught the foul ball. Victoria’s hand was a little sore after that jacked-up high five I gave her. 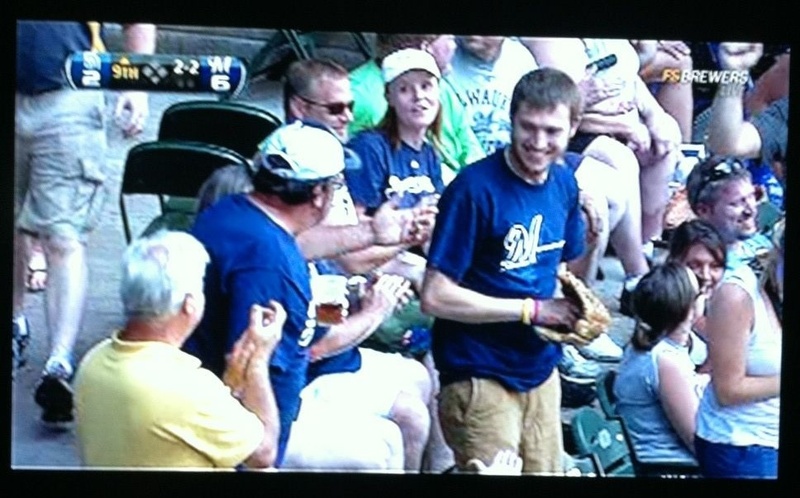 The other guy I gave a high five to was the one who had said “you just took your glove out!” after I made the catch. I had a few appointments in Madison on Monday, and I left for Kansas City when I was done at 2 pm. I arrived at Tom at Danielle’s place at 10:20 pm, and went to bed shortly thereafter. Tom & Danielle are engaged, and they met while in the dorms freshman year at UW-Madison. They too were Gilman House residents, along with myself, Victoria, Alex, Jess, Katie, and Allison. I stayed with Alex and Jess in Chicago, saw Katie at the game on April 9th at Wrigley, and Victoria and I stayed with Allison in San Francisco in May. 1) One of the hallways in the complex. 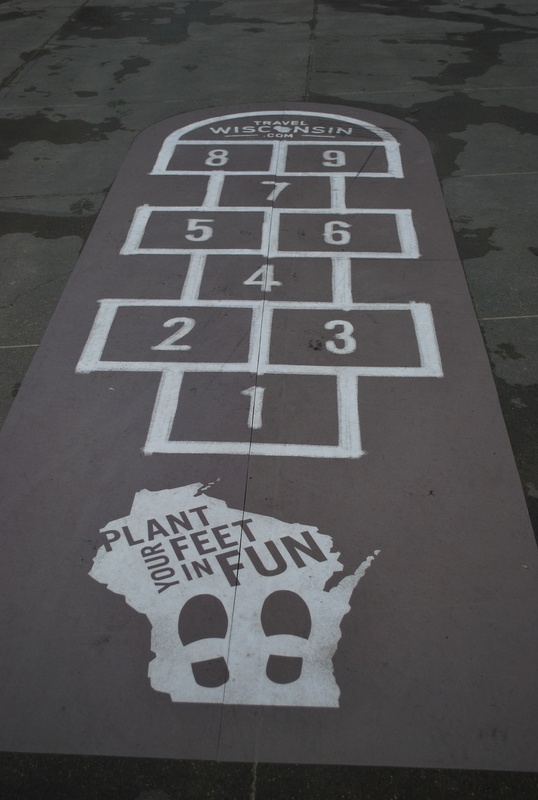 I was surprised to see cement floors. It probably makes it easier to clean and it’s cheaper, since you don’t have to worry about replacing the carpeting. 2) The interior of their apartment, taken from the kitchen area. It’s a two bed / two bath so I got my own side of the apartment! I’m sleeping on an air mattress (not at this exact moment) and have had no complaints. Thanks guys!!! 3) The view out of their kitchen window(s), not too shabby. 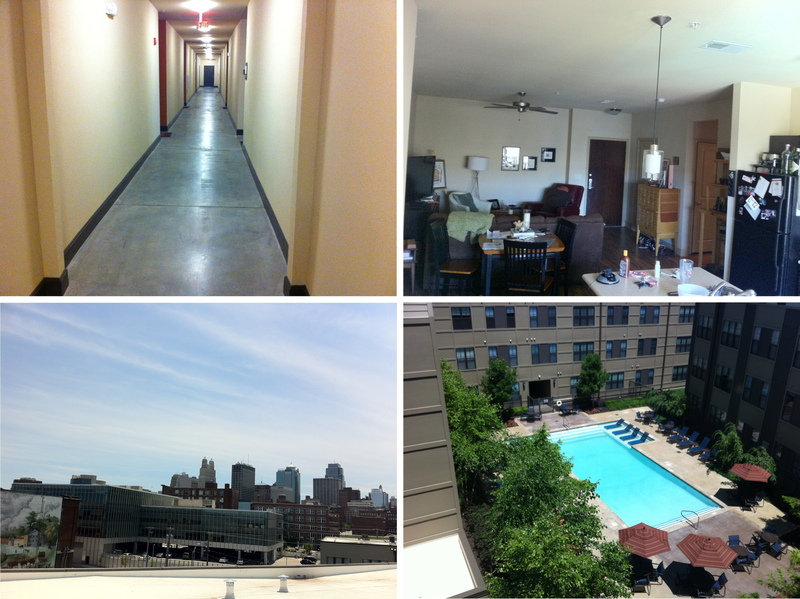 4) The view of downtown Kansas City from the attached parking garage for the Market Station Apartments. 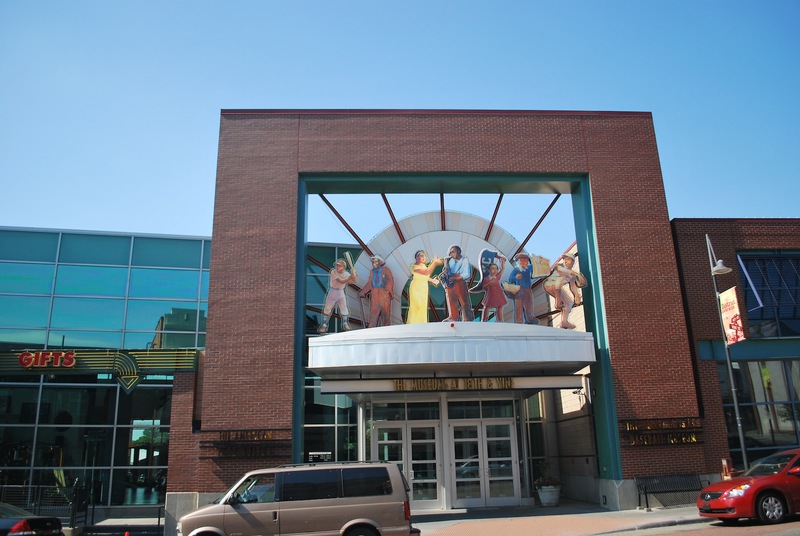 1) The exterior of the building that Oklahoma Joe’s is in. Is that a gas station? It sure is. 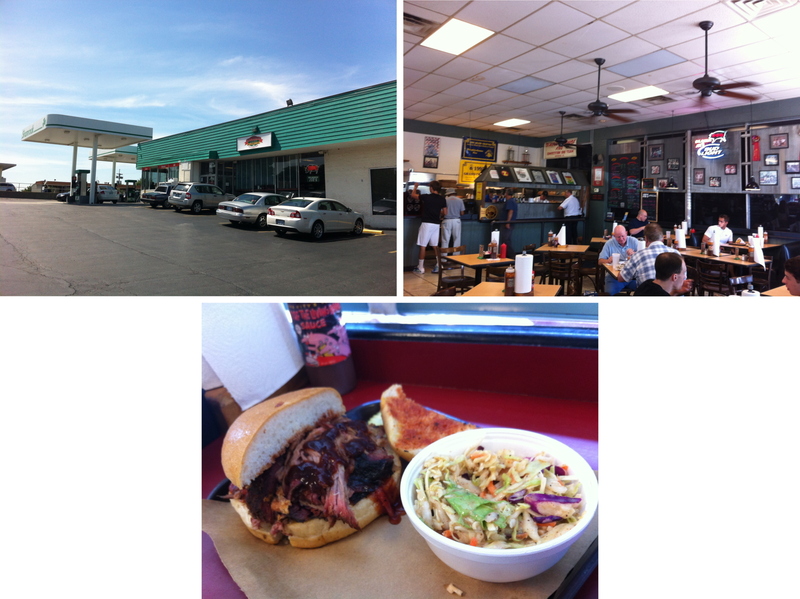 2) The interior of the restaurant, behind me and to the left was the gas station side of the store. When I was buying a bottle of the BBQ sauce the lady behind the gas station counter was taking orders for Oklahoma Joe’s, so it seems there is a good relationship between the two establishments. 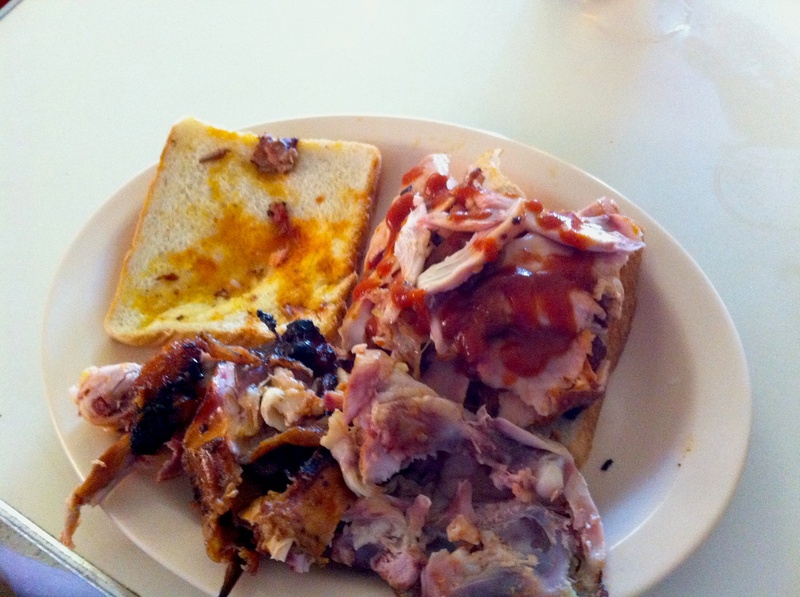 3) My lunch; the Jumbo Pulled Pork sandwich and a side of Spicy Slaw. The pulled pork had just the right amount of smoke, and it was amazalicious. For $2.39 I’d have to give the slaw a solid B. For that price I was expecting to be blown away. After lunch I went back to Tom and Danielle’s place and started getting ready for the game. Danielle got home from work around 5:15, and Tom 5:55. Two of their friends (Ben & Kristen) picked us up at 6:00, and we were parked by 6:20. 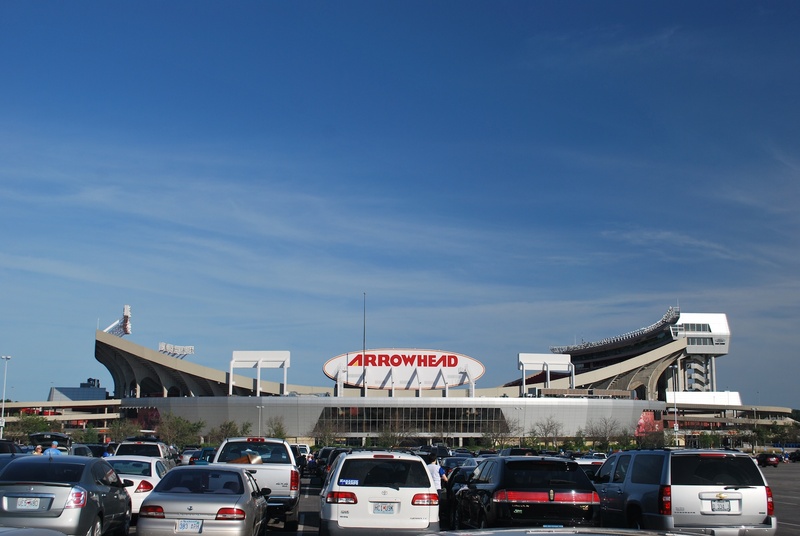 Kauffman Stadium and Arrowhead Stadium (where the Kansas City Chiefs play) are located right next to each other, and share parking lots. We parked in one that was right in front of Arrowhead. 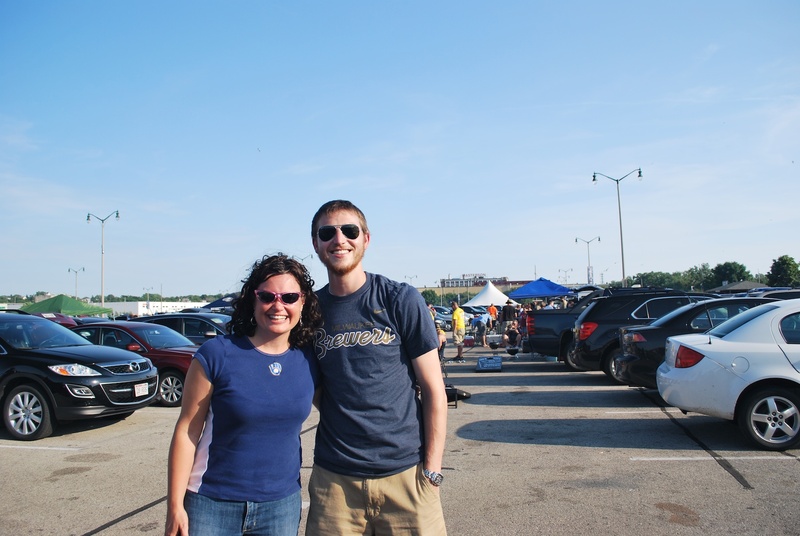 Ben and Kristen had picked up some fried chicken along with some other items for the tailgate. 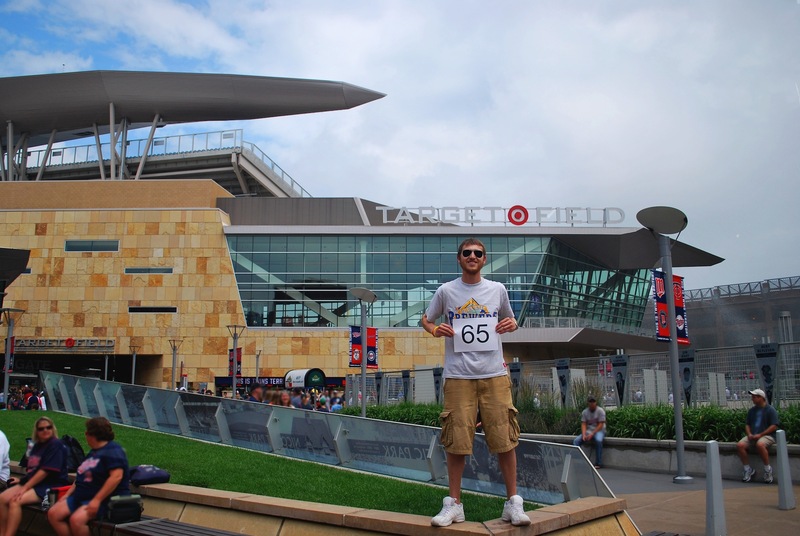 I ate two pieces of chicken, had a beer, but then had to take off, to make sure I could get my ticket and exterior game number picture prior to the game. 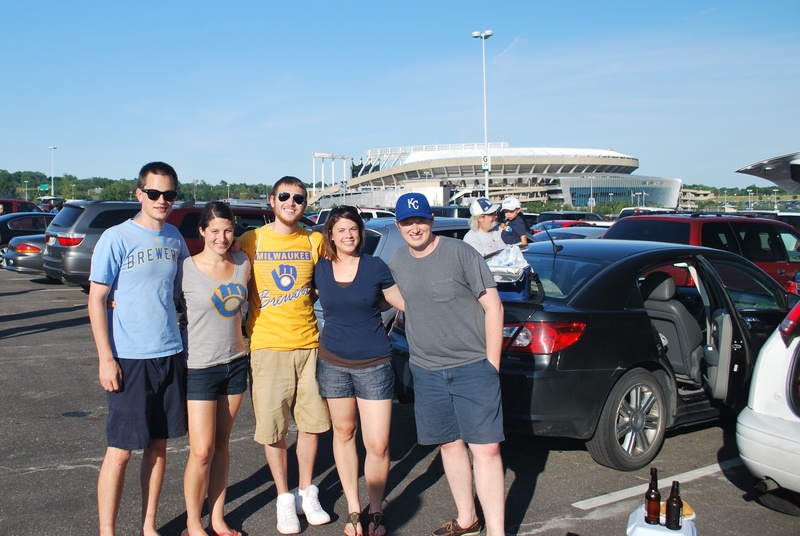 Before I left them I had a nearby Brewers fan take a picture of the five of us. Left to right it’s Tom, Danielle, myself, Kristin, and Ben. 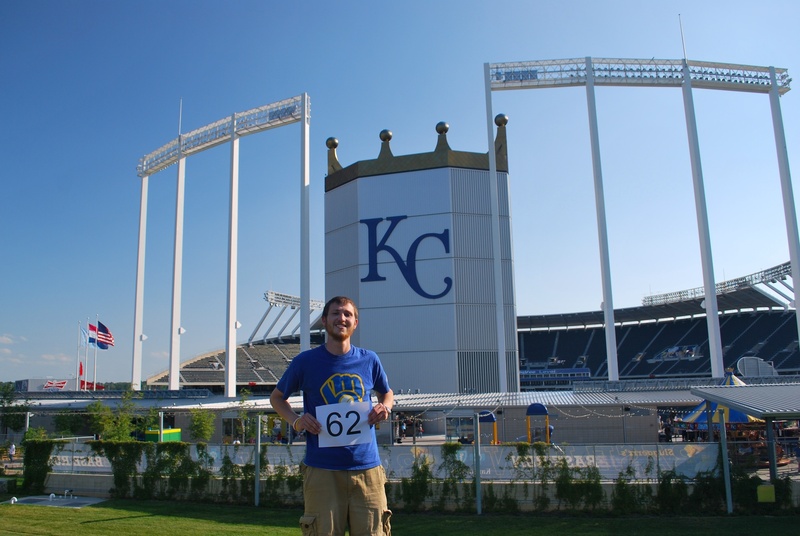 I was a little disappointed to find out that the Royals don’t have exterior Kauffman Stadium signage. I think that should be a law. 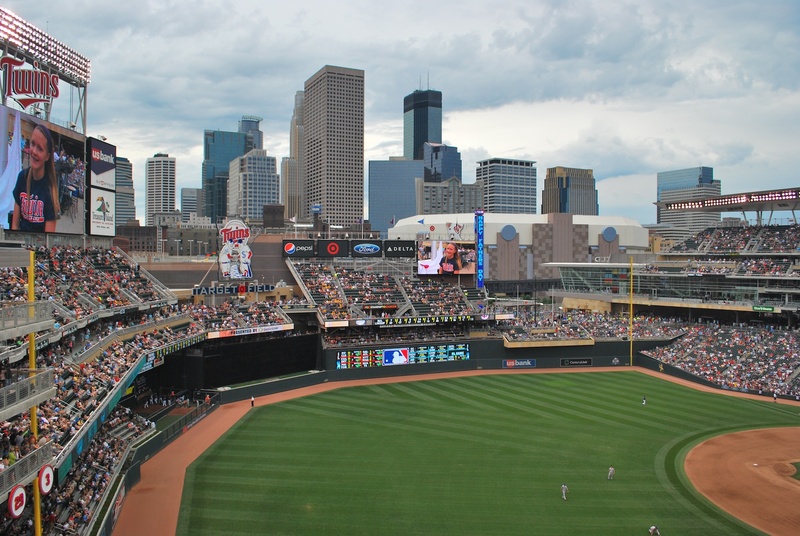 I explained to a stadium employee what I wanted and she told me I should go to the upper deck and get a picture with the field in the background. I explained that I was planning on doing that for one of the other games, but needed an exterior picture for the first game. I settled with the following for game photo number 61. 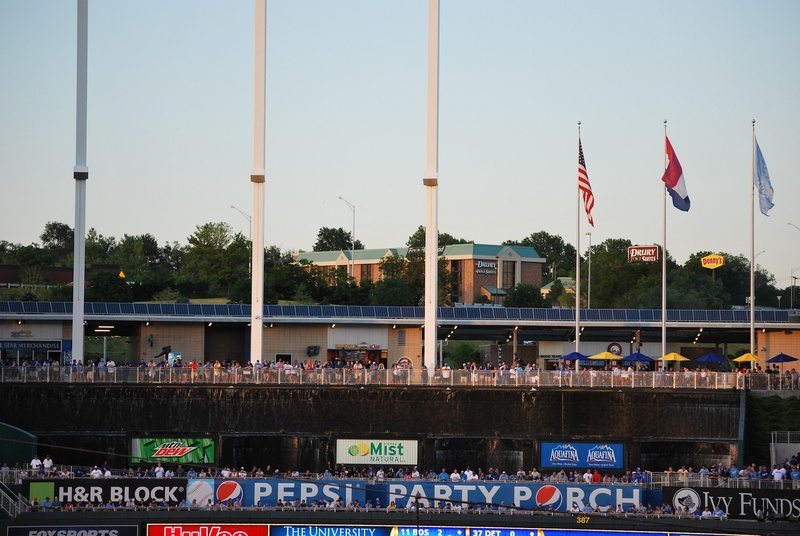 I know it says “Royals” on the side of the stadium, but most places have the stadium name somewhere on the outside. 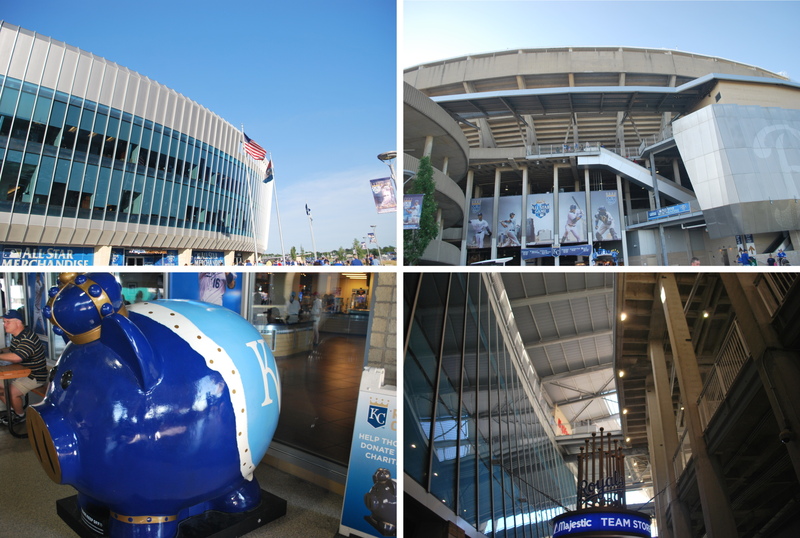 1) The addition to Kauffman Stadium when they did some remodeling from 2007-2009. 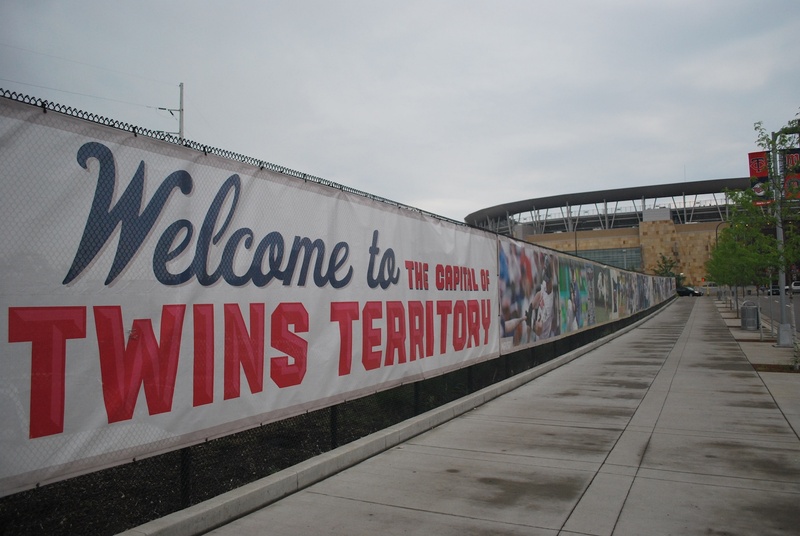 I was here in 2006, so I hadn’t seen any of the upgrades. 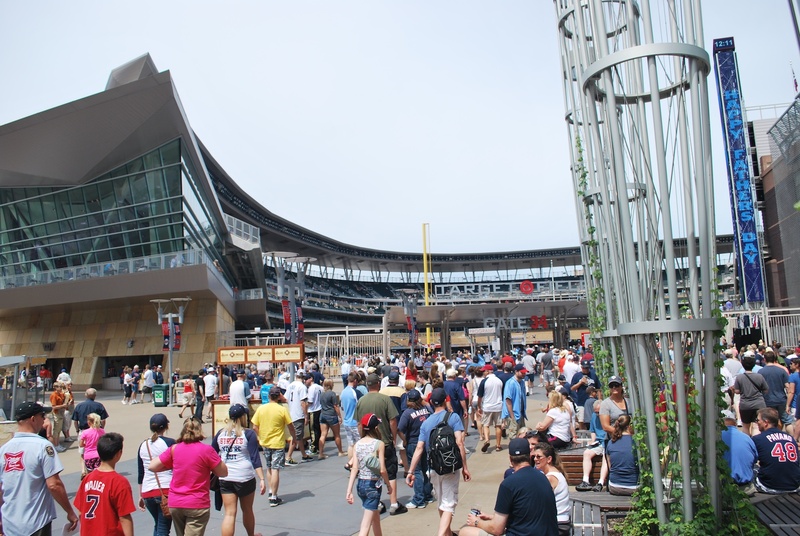 2) Just after getting my ticket scanned I took a picture of the home plate entrance. I must admit that it’s not too inviting or exciting. 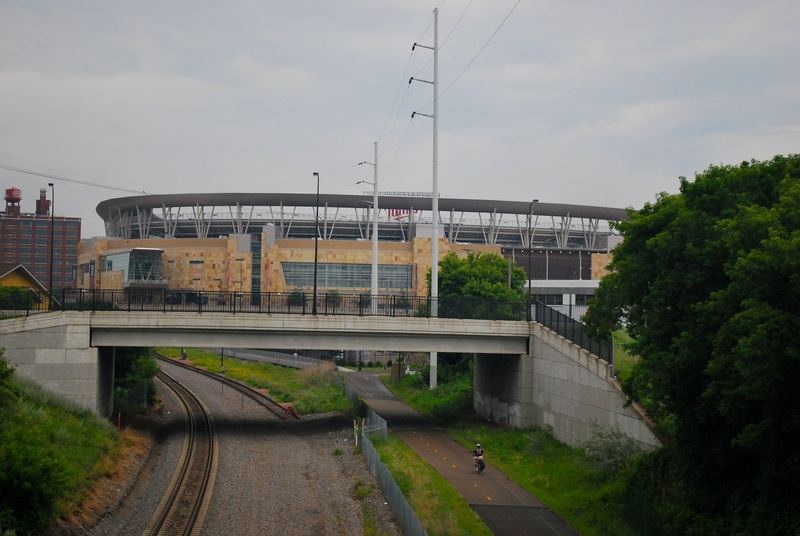 3) The addition on the left, with the original stadium architecture on the right. 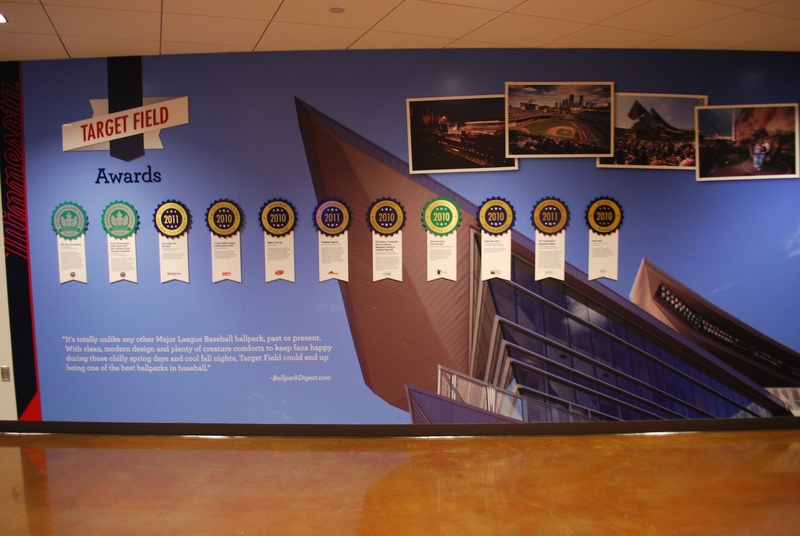 The addition holds offices, the team store, and other aspects of an MLB team. 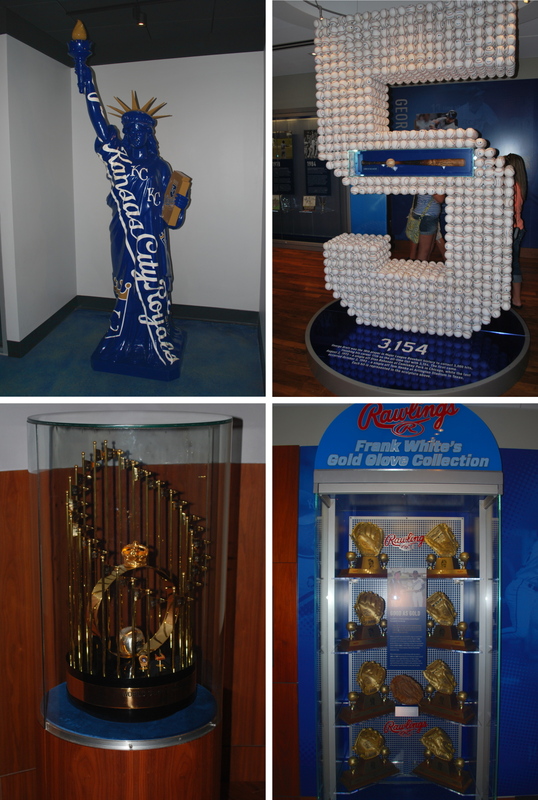 4) A giant piggy bank that is sporting Royals colors. The national anthem had been playing when I was getting my bags checked at the gate, and had to wait there before heading inside. I got to my seat at about 7:09, and the game started one minute later. This was the view from my seat in the last row of section 225. 1) Braun lining up Mendoza to lead off the seventh. 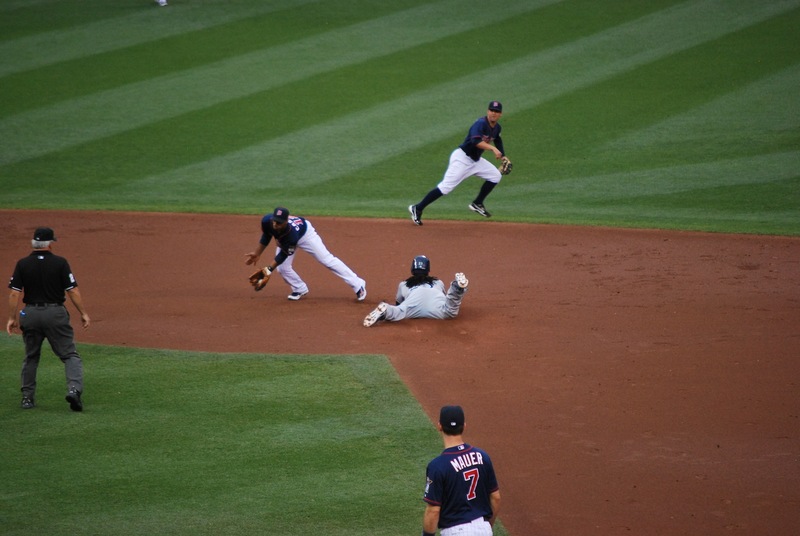 2) Braun sliding into second base after the third baseman’s throw got past the first basemen. This picture doesn’t show that the ball had gotten past Escobar who was covering second. 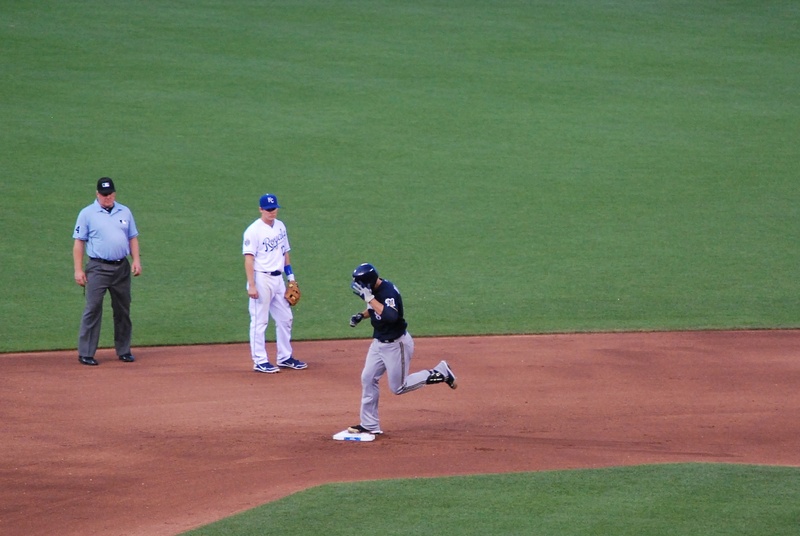 3) Braun arriving at third after the second error of the inning. 4) After an Aramis Ramirez walk Taylor Green lifted a short fly ball to left that was caught by the left fielder. 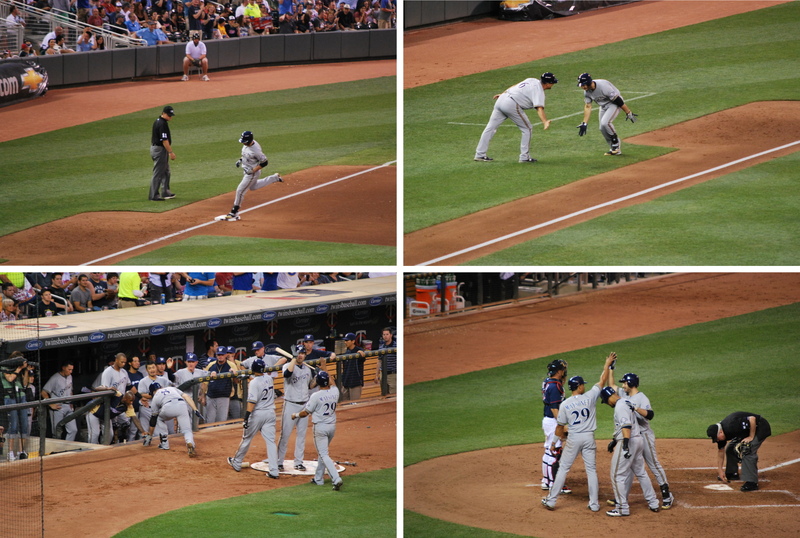 Braun tried tagging up but was thrown out by quite a bit. It wasn’t even that good of a throw, but Gordon was so shallow once he caught the ball that there was a large margin for error. 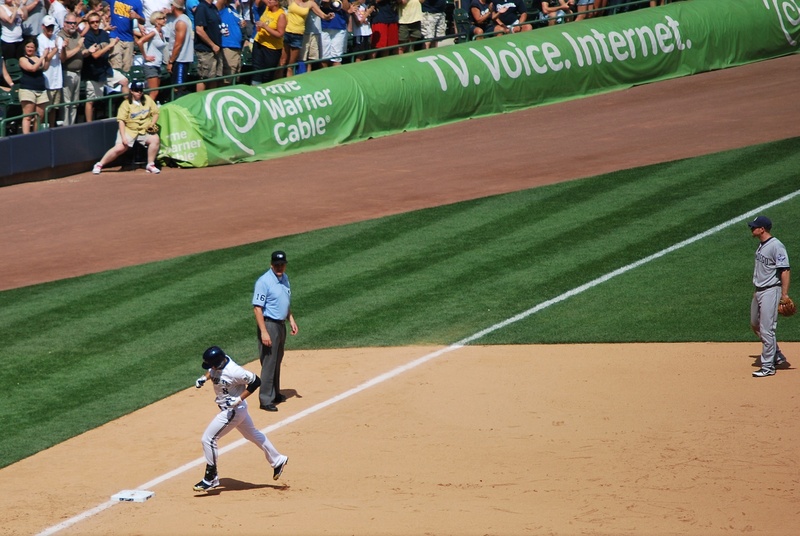 After the double play the Brewers were left with the slow-footed Ramirez at second and Rickie Weeks at the plate. Rickie came through with a bloop single and Ramirez barely beat the throw home to tie the game at one. 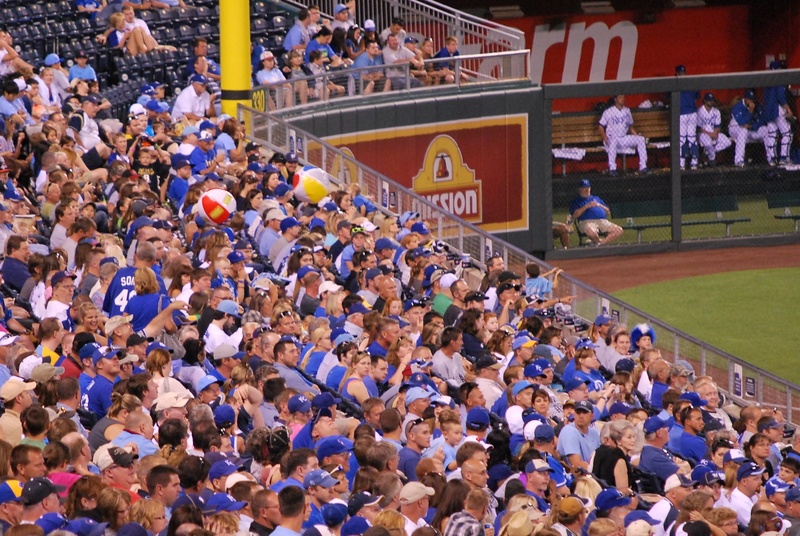 It remained tied until the bottom of the eighth, when the Royals got a leadoff double from Gordon. 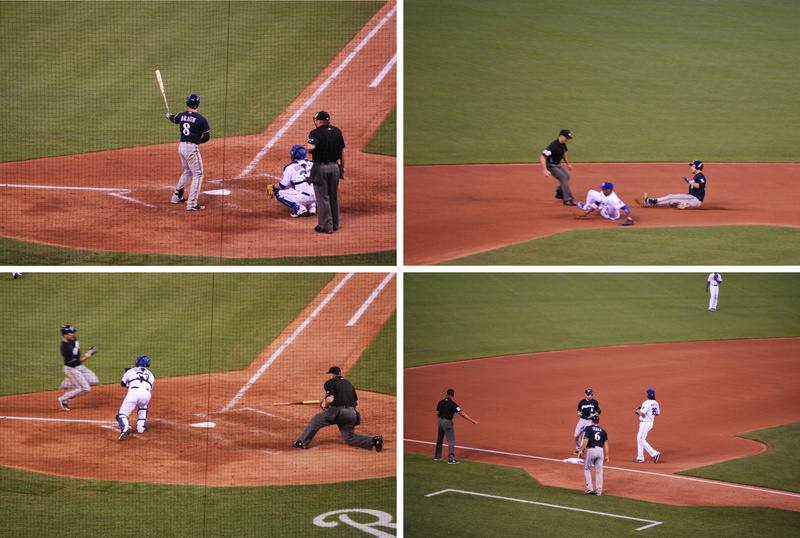 He was sacrificed to third by Getz and then Billy Butler drove him in with a single to center. 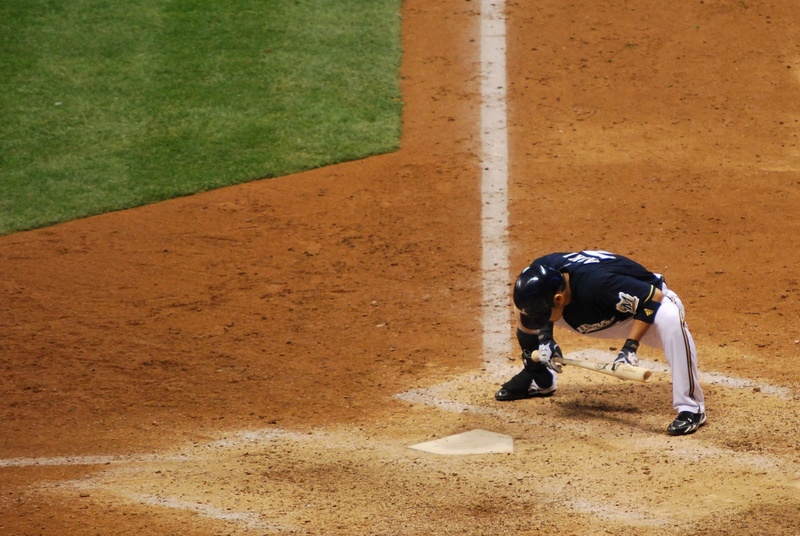 The Brewers had runners on first and third with only one out in the top of the ninth but failed to get a run home. Kottaras struck out swinging and pinch hitter Brooks Conrad grounded into a game ending fielder’s choice. 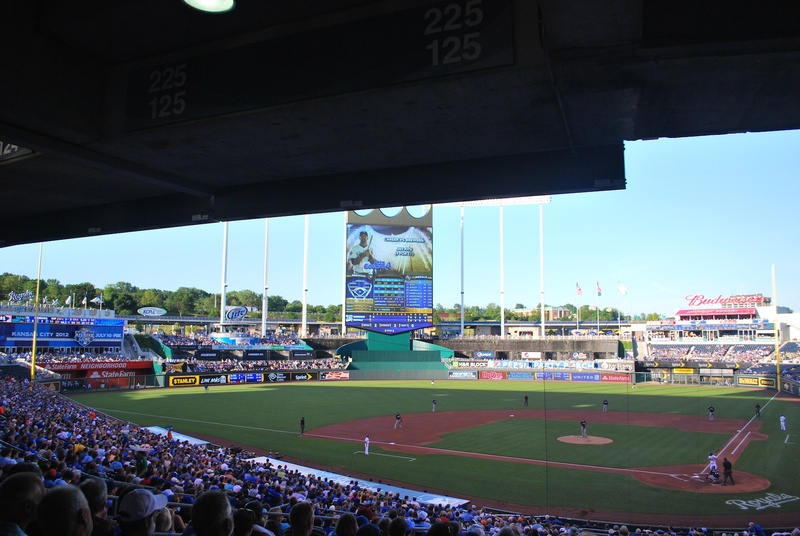 Final Score: Royals 2 – Brewers 1. I also took a picture between innings, later in the game they turn on lights that make the fountains colorful, but I won’t include one of those pictures today. 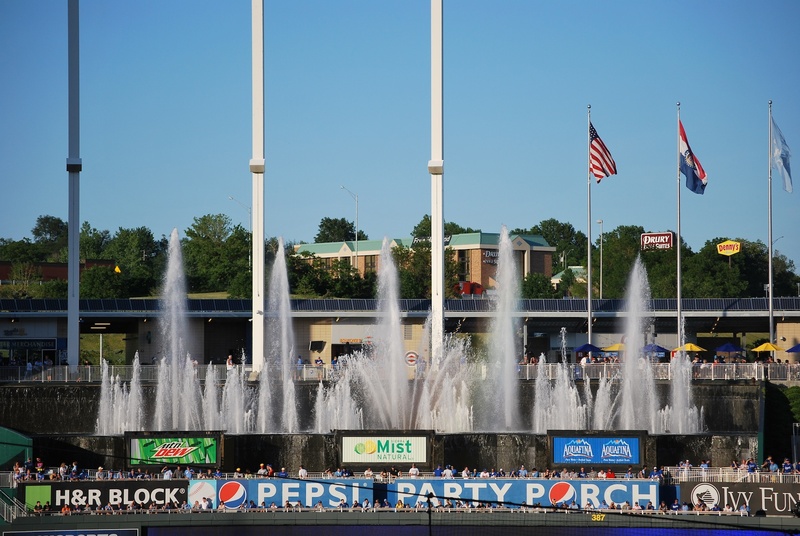 They also turn the fountains on when a Royal hits a home run. So on Tuesday it didn’t take long for that fact to be confirmed. 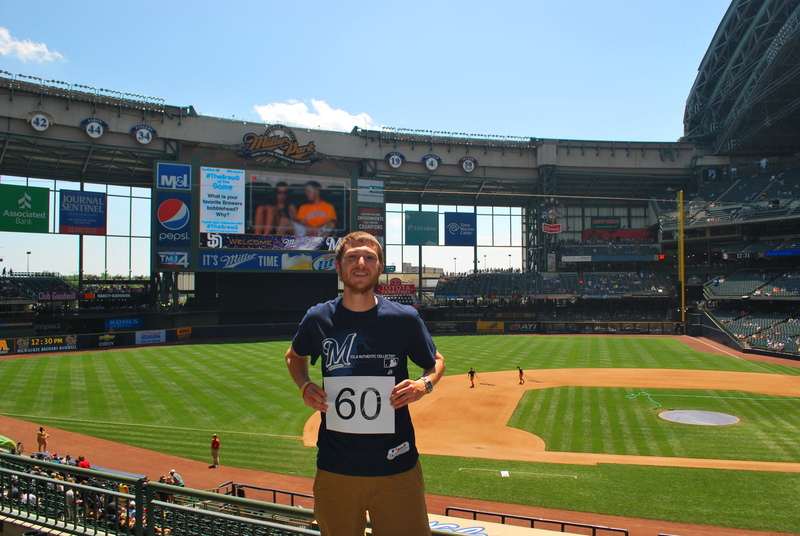 A friend from Fort Atkinson is joining me at today’s (Wednesday’s) game. 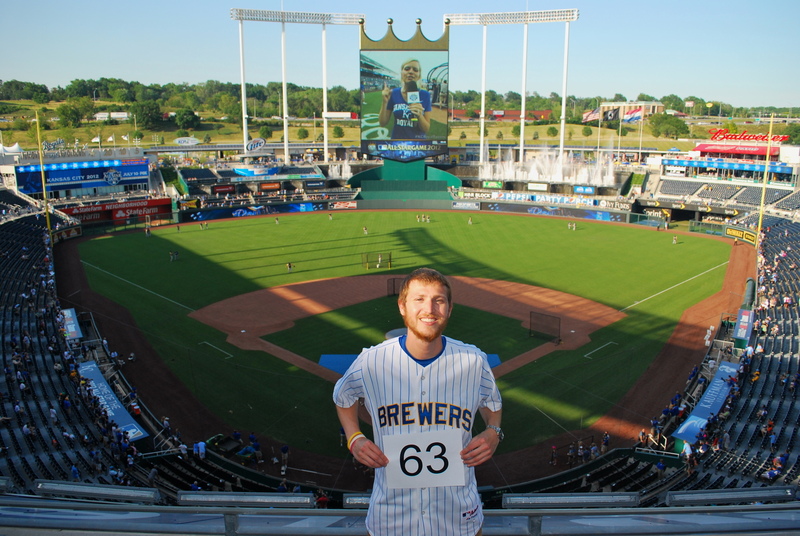 He is currently living and working in Omaha, and is making the trip down to see the Brewers take on the Royals in game two of the series. 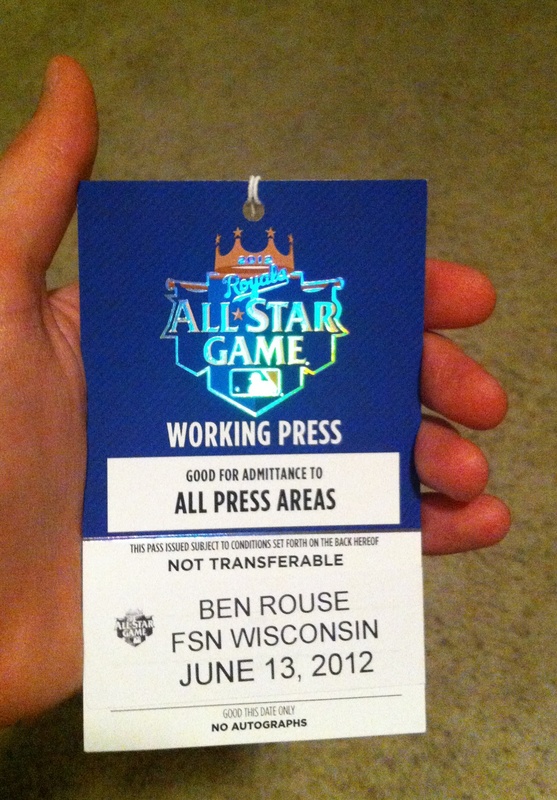 In other news: I will be on FS-Wisconsin’s telecast tonight during the fourth inning. Craig Coshun just contacted me and informed me of the on-air appearance. Tune in, check it out, laugh at my pathetic “beard”. If you haven’t joined the bone marrow donor registry yet (and are 18-60), you should seriously consider it. There will be a drive in Madison on Thursday, June 21st at the Central Wisconsin Center on Knutson street from 10:00 am to 4:00 pm. There will also be a drive in Milwaukee on Wednesday, June 27th at Kaplan college on West Pleasant street from 9:00 am to 1:30 pm. I slept in until 10:00 on Sunday morning and it felt good to get over nine hours of sleep. Victoria and I had been staying at her Aunt and Uncle’s in Sussex, and left the house by 11:30. We were parked in the Braves 1 Lot by 12:09, and made our way inside. 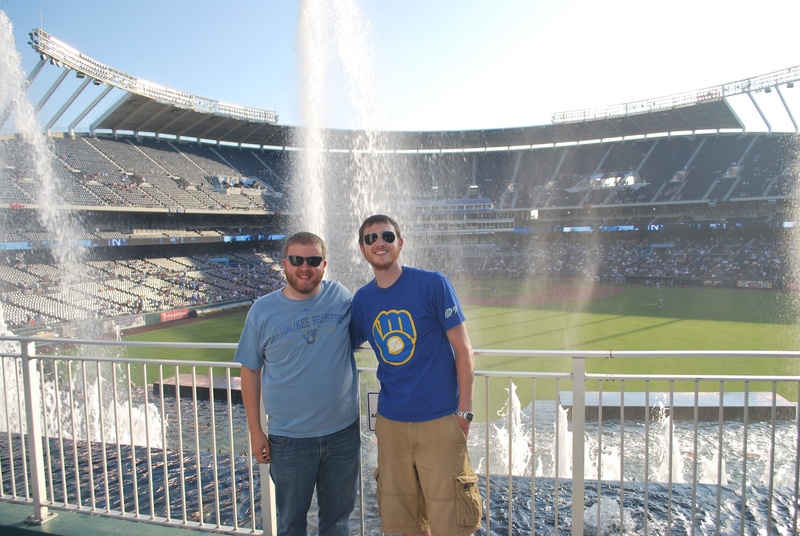 If you’re new to the blog I’m getting a picture taken when I’m at each game. When at home I’m getting it taken from a different section for each game (since there are so many). 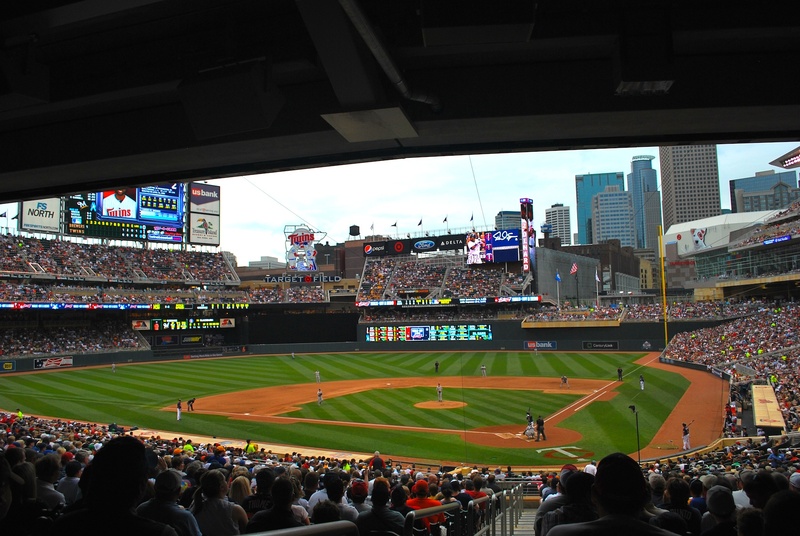 I’m slowly working my way around the loge level, and on Sunday I had it taken in section 224. After getting the game photo taken care of, Victoria and I went and said hi to the Ice Man and then went up to section 425. 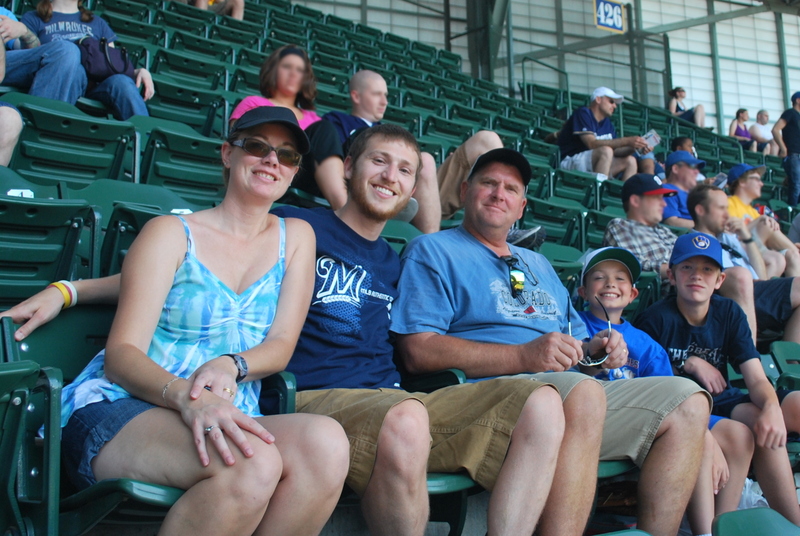 My Uncle Mark and Aunt Deb were at the game with their two sons; Wade and Travis. 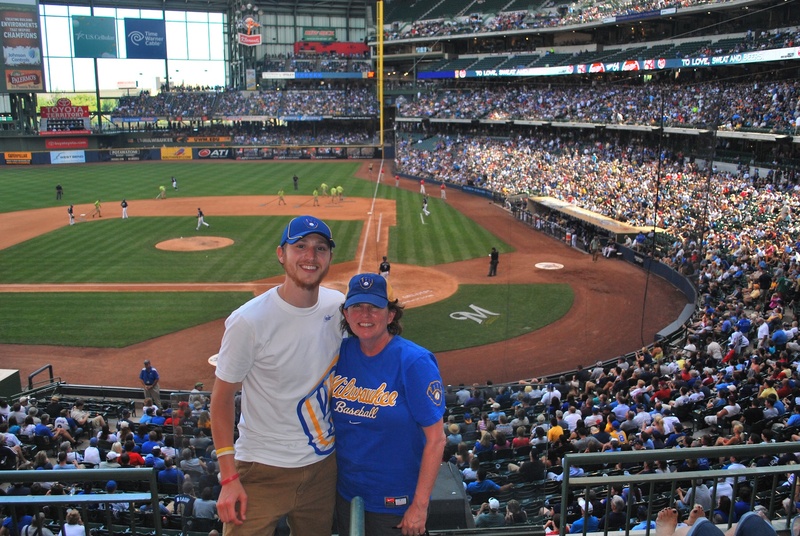 Wade had gotten four tickets to a Brewers game for Christmas, and it just so happened that I was at the same game. That’s CRAZY!!! 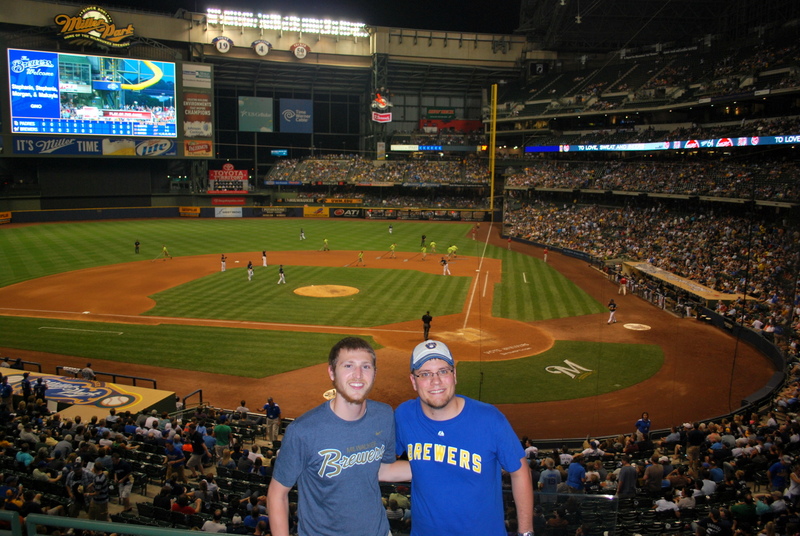 This was Wade and Travis’ first Brewers game, and Mark and Deb’s first since Miller Park opened. Below you have Deb, myself, Mark (my mom’s younger brother), Travis, and Wade. My mom is a Sykes, and has 11 siblings. In 2010 the family made a address and birthday handbook thing, and I referenced it to see how old Travis and Wade were. I was shocked when I saw that Travis just turned 10 and Wade 14. I know I’m only 25, but now I feel old. Victoria and I went back down to the loge level, and decided to watch the majority of the game from the concourse above section 213. For some reason they decided not to close the two panels on the first base side, and it allowed for some good photo opportunities. 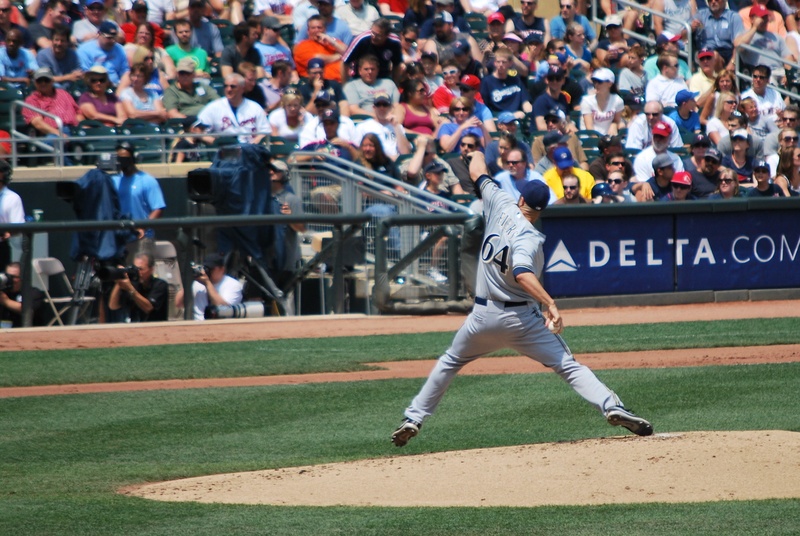 Gallardo was on the mound for the Brewers, and he gave up a solo home run in the first and another run in the second on a ground out. 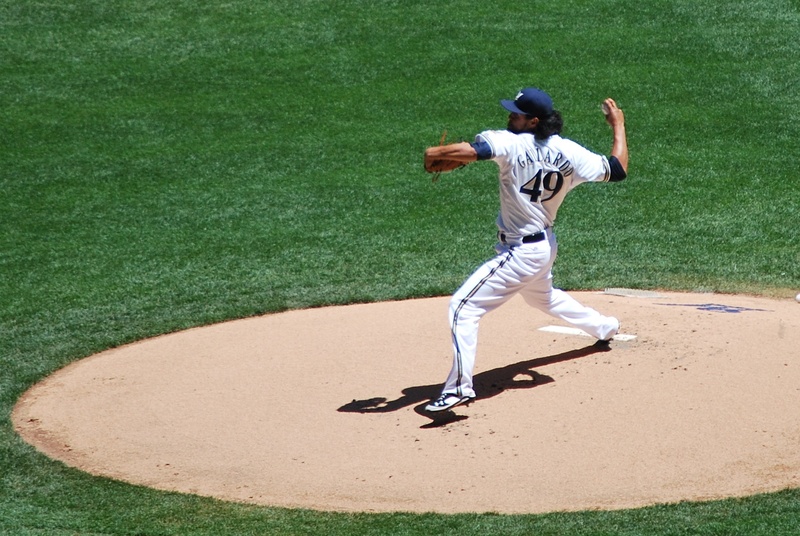 This is Gallardo pitching in the first. 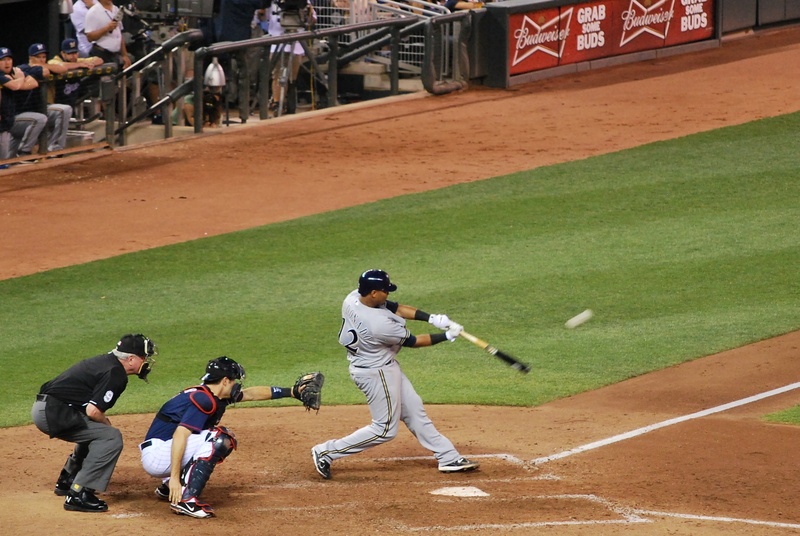 Aramis Ramirez led off the bottom of the second inning with a ground out to the shortstop. 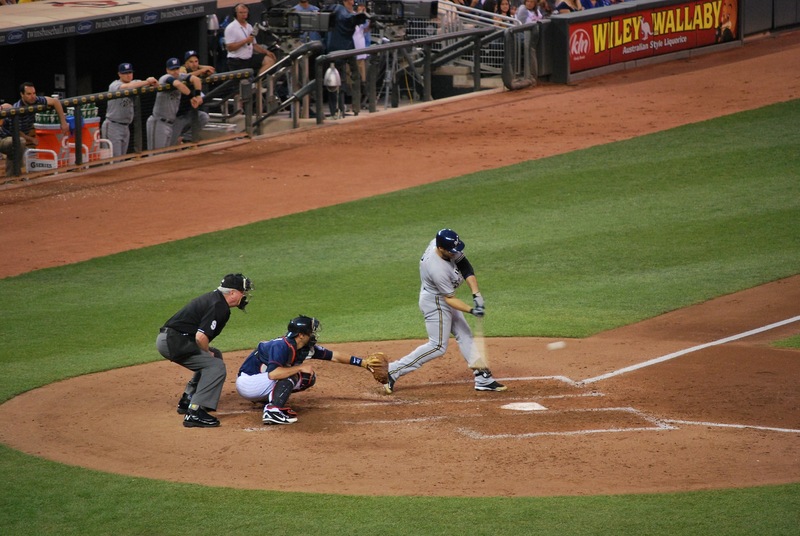 I snapped a picture just after the ball bounced off the infield dirt in front of home plate. You can see the dirt flying from the impact. In the top of the third, Chase Headley of the Padres walked, and then attempted to steal second. 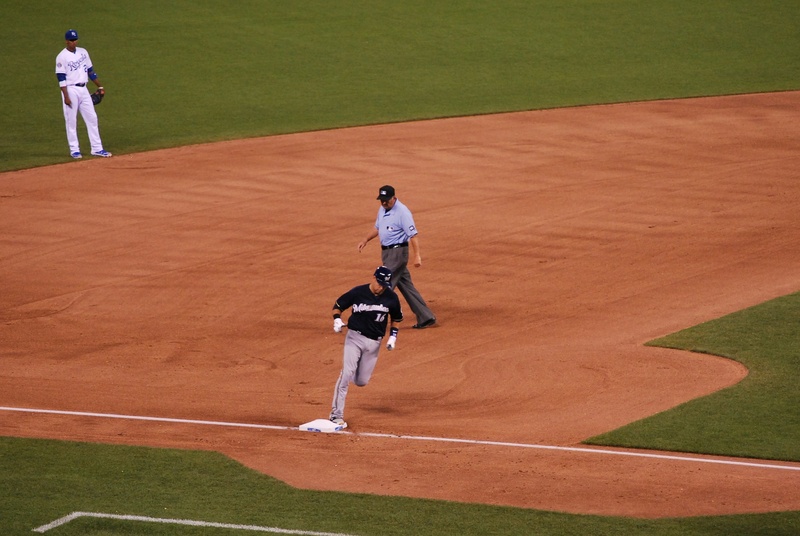 I’m not sure he would’ve been out, but Weeks got charged with an error on the play, and Headley wound up at third. 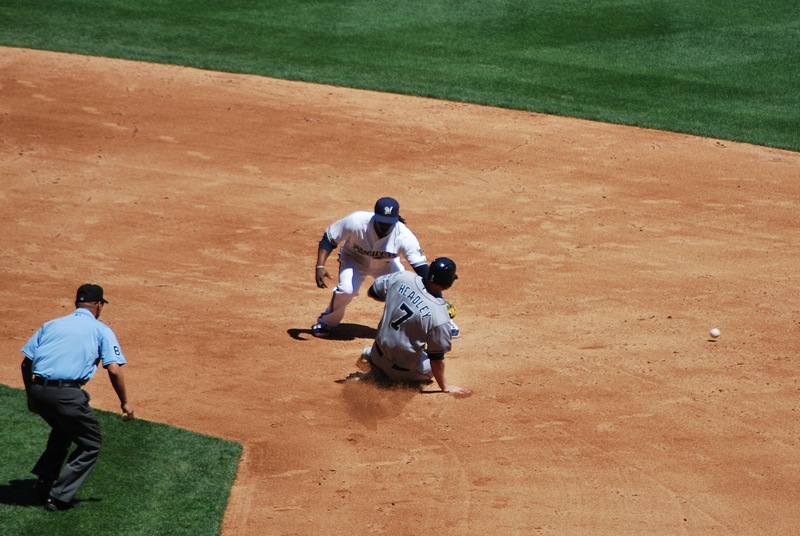 Here’s Headley sliding as the ball heads towards the outfield grass. In the fourth, Cameron Maybin grounded to Rickie Weeks for the second out of the inning. 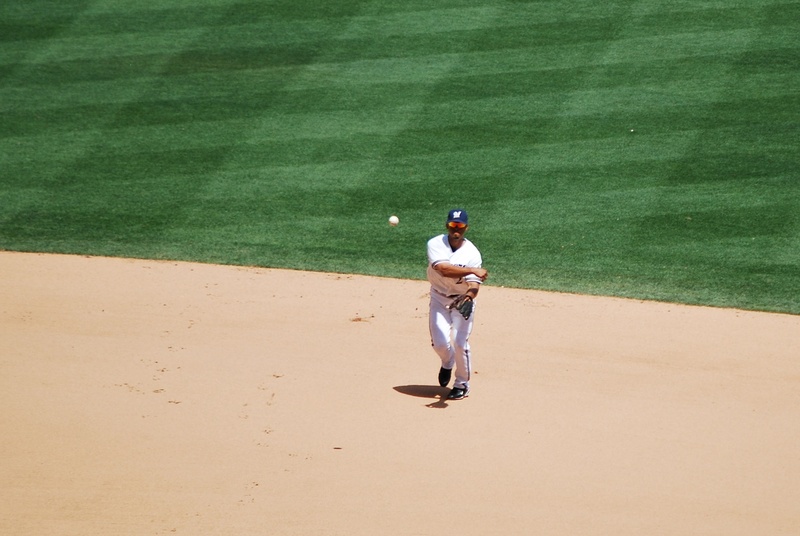 I snapped a picture of Rickie as he was about to release the ball, to show how much of a sidearm delivery he has. In the bottom of the fourth I swapped out my zoom lens for the standard 18-55 mm and zoomed out to show our view from the concourse. Anthony Bass had just let go of a pitch, with Taylor Green at the plate. 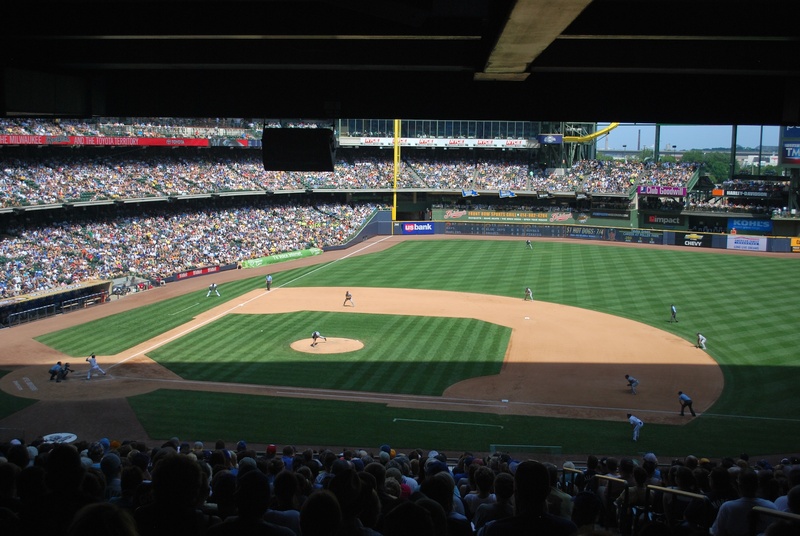 The roof’s shadow is between the mound and the plate, and this is what the Brewers prevent from happening when they close the two roof panels on the first base side . 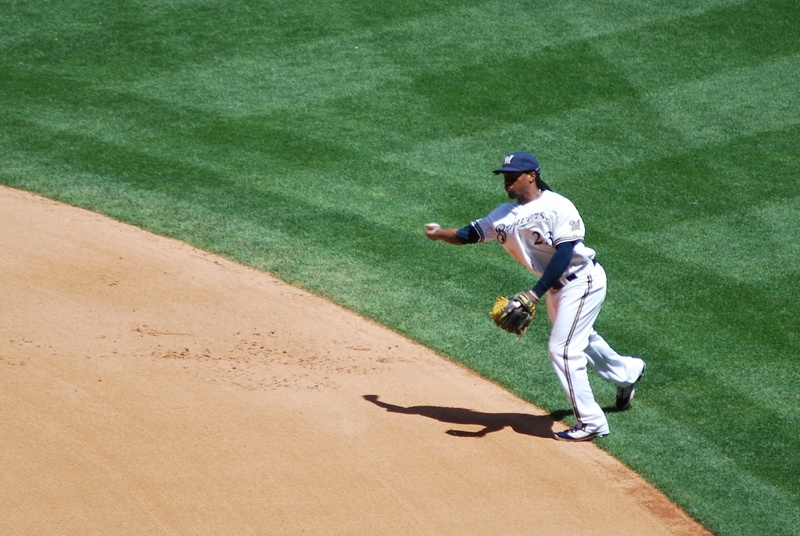 In the top of the sixth Cameron Maybin grounded out again, this time to shortstop. I got a picture shortly after Edwin Maysonet let go. The throw wound up high, but Corey Hart jumped for it and on his descent tagged Maybin on his way to first. The score was still 2-0 going into the bottom of the sixth, and that’s when things got interesting. Aoki led off with a single, stole second, and then advanced to third on the throwing error by the Padres catcher. 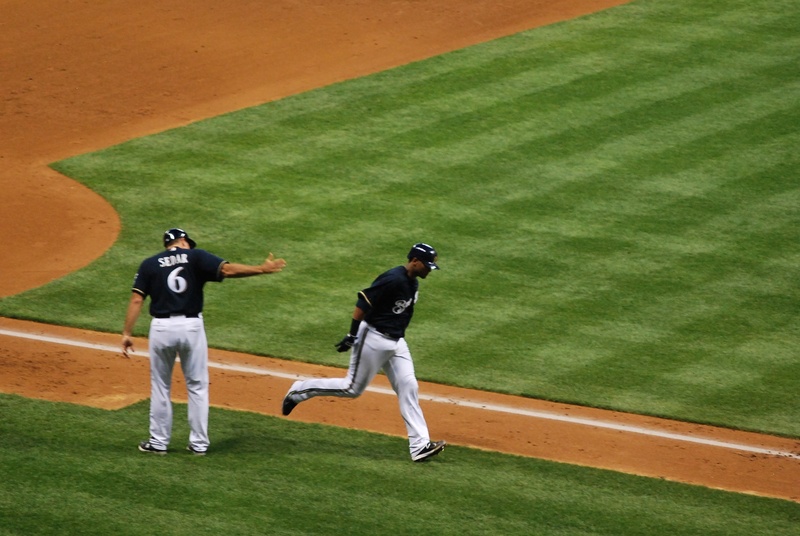 Braun singled in Aoki and the Brewers were on the board. 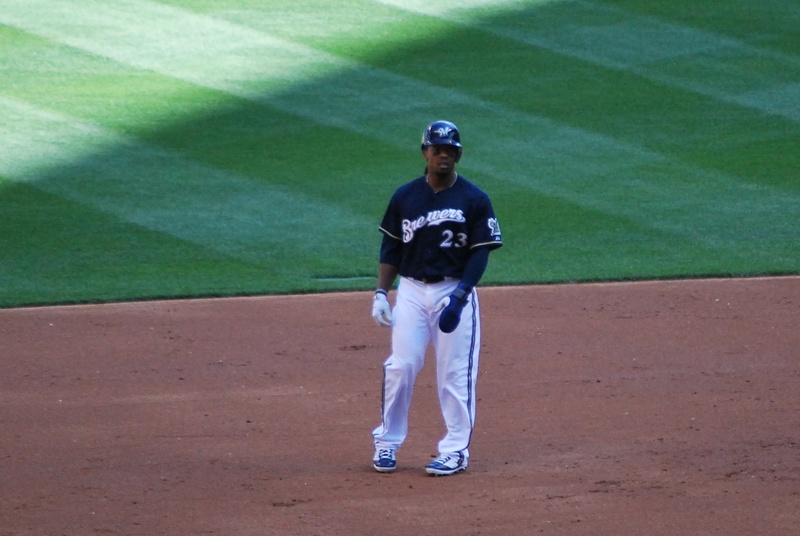 Two outs followed Braun’s base hit, but then Rickie Weeks walked to bring up Martin Maldonado with two on and two out. 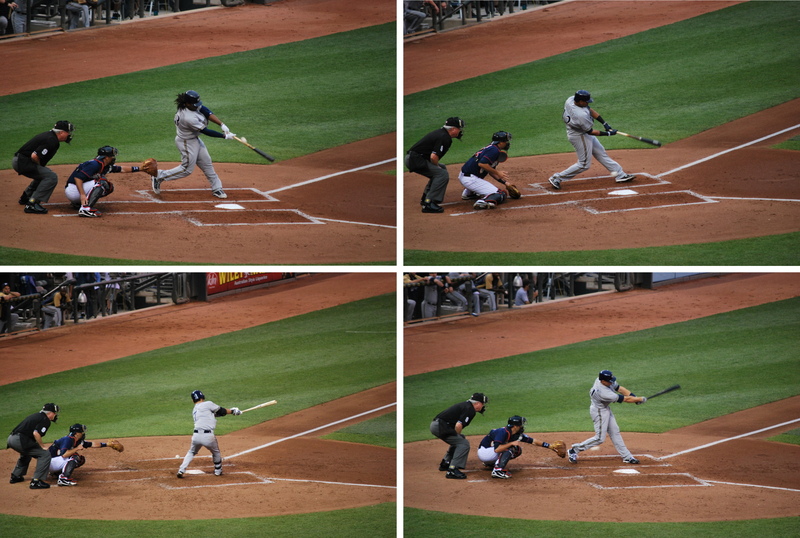 On the first pitch Maldonado lifted one to deep center, and Cameron Maybin looked like he had a read on it. He leaped and it just missed his glove, clearing the fence by just a few inches. 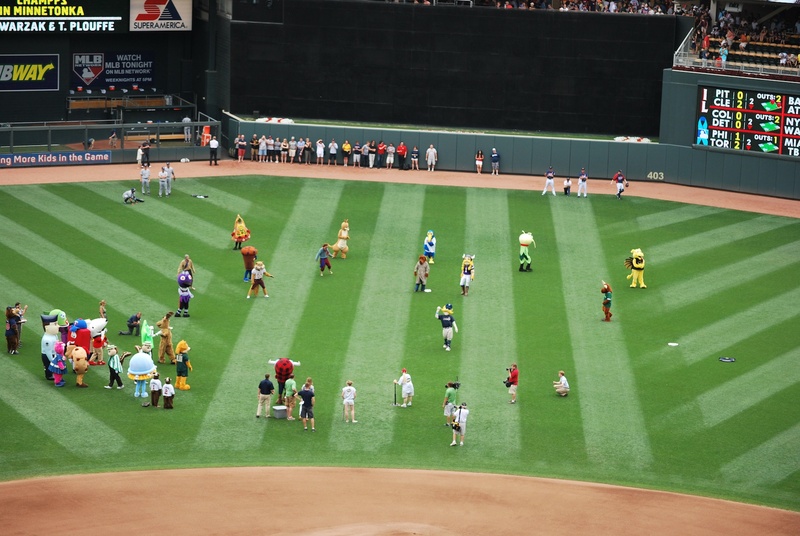 As Maldonado was rounding third I got a picture of the action. Ed Sedar is waiting with his hand out, Maldonado is preparing for the medium five, all while the crowd goes wild. Maysonet followed Maldonado with a triple to center, but he was stranded at third. 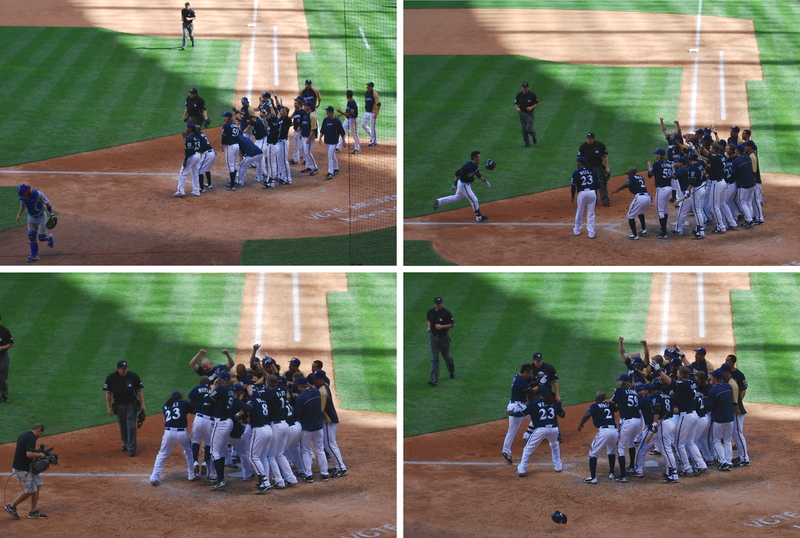 In the bottom of the seventh Aoki walked with one out and Braun followed with his 15th home run of the season. 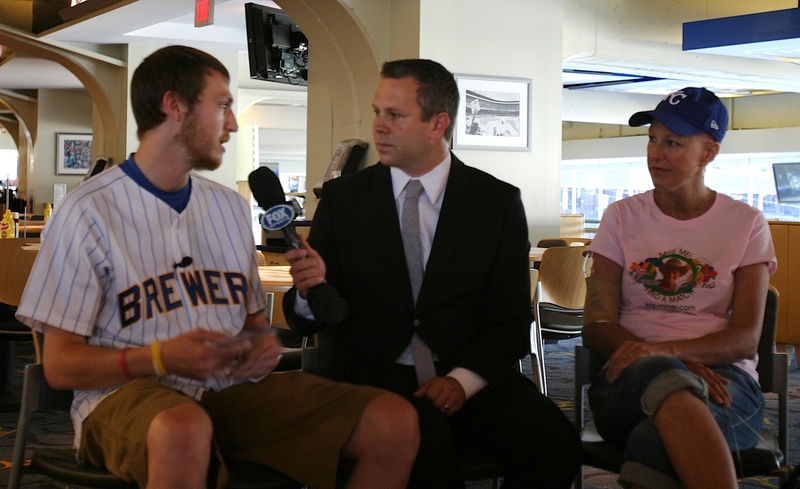 It gave the Brewers a four run cushion, and I was liking our chances. In the bottom of the eighth Victoria and I went down to say hi to Bill (I joked that I had just gotten there, but then reassured him I had just been watching from the concourse). We stood for the bottom of the eighth but then sat down in section 221, but not in my ticketed seats. To get to my seats on the other aisle we would’ve had to either make a bunch of people stand up, or go up into the concourse and back down the staircase that our seats are on. We just sat in two aisle seats opposite mine, in the 9th row. As Axford started pitching in the top of the ninth, I realized that with a upper nineties pitcher on the mound, and with a lefty at the plate (Everth Cabrera), I should probably have my glove on. After the first 2-2 pitch I reached into my bag which was on the seat in front of my and not five seconds later Axford delivers and Cabrera fouls it back my way. I took one step into the aisle and made the catch. I almost didn’t catch it because I was so excited that I had started to close my glove too soon, and it didn’t land in the webbing. I gave Victoria a really hard high five and was all smiles/laughs. I wonder if I would’ve caught it without my glove. 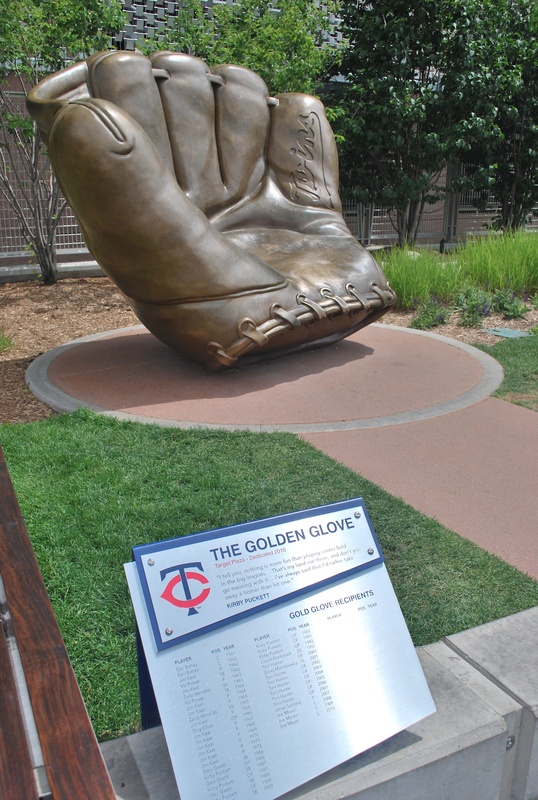 It’s always more impressive when you can, but the embarrassment involved in dropping it always outweighs the potential haters who say you shouldn’t wear a glove. I actually heard a guy in my row talking to his friends saying that I should’ve been a “man” and not used a glove. I’m pretty sure the players have gloves on the field, but I’m not going to rant. The guy to my right said “and I saw you get your glove on right before that”. Someone tweeted a picture of me when FSN showed me on the broadcast. I’m recording the replay tonight to see if they actually showed the catch, or just me afterwards. I’m talking to the guy that I mentioned above. The ninth inning almost gave me a heart attack. The Padres scored three runs, all charged to Axford, and then still had the bases loaded with two outs. Thankfully John Baker was called out on strikes on a 3-2 pitch from Jose Veras, and the Brewers narrowly escaped with the series win. Final Score: Brewers 6 – Padres 5. 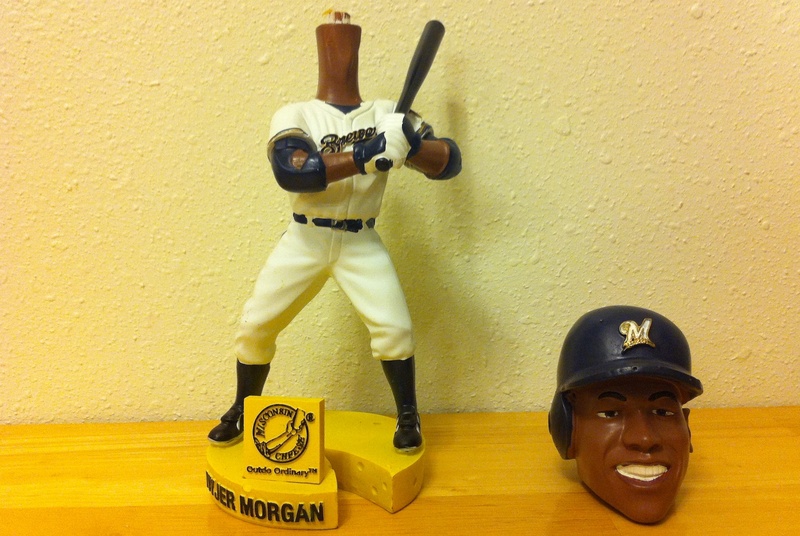 When Victoria and I got back to Madison I took our Nyjer Morgan bobble heads completely out of the boxes to inspect. Apparently they didn’t put enough glue on, because his head wasn’t connected to the spring when I took it out of the plastic. It’s an easy fix though, so I’m not too upset. 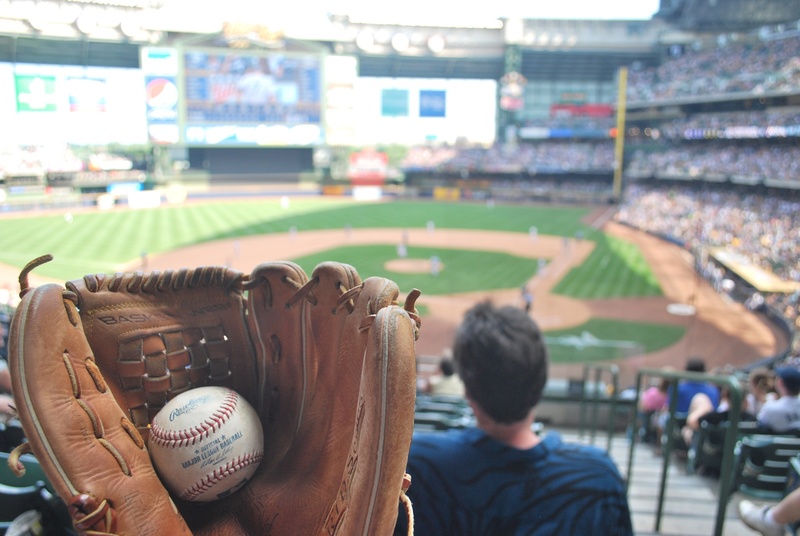 I also took a close up of the foul ball that I caught. 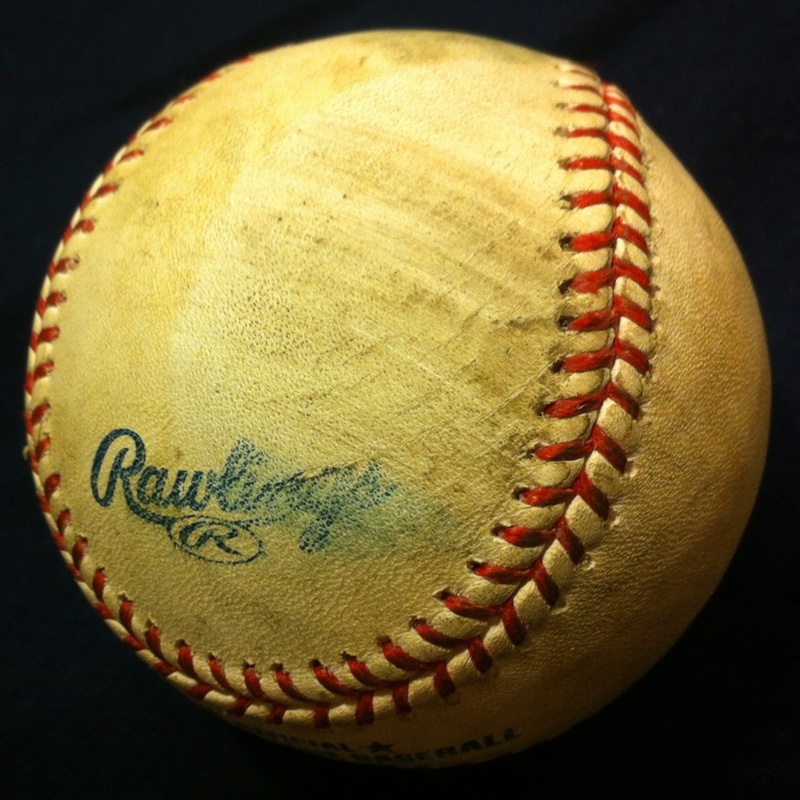 Cabrera just barely got a piece of it, and you can see the scuff mark and the smeared “lings” of the Rawlings logo. All around I would say it was a good day. I have occupational and physical therapy appointments at 11:00 am and 1:15 pm, respectively, and then am heading for Kansas City. I’m hoping to get there by 10:00 pm. I don’t know if they’ll be a post about off day number seven, mainly because I don’t think listing things I see on my boring drive will be interesting. I got back to Madison at 11:59 pm on Friday night, wrote the blog post about the day, and was in bed by 2:30 am. I got up at 10:00 and Victoria and I were on the road at 11:56. We made it to the Money Lot at 1:34, and I walked around for 30 minutes informing people about my mission and Be The Match. It can be fun and frustrating at the same time. One tailgate will be excited about either the baseball or my story, and then the next will have someone almost laughing at another member in their group as I’m telling them about the donor process and how easy it is to join the registry. I have no idea how I would react if someone came up to a tailgate I was in and explain what they’re doing, but I don’t think I would be tempted to laugh. 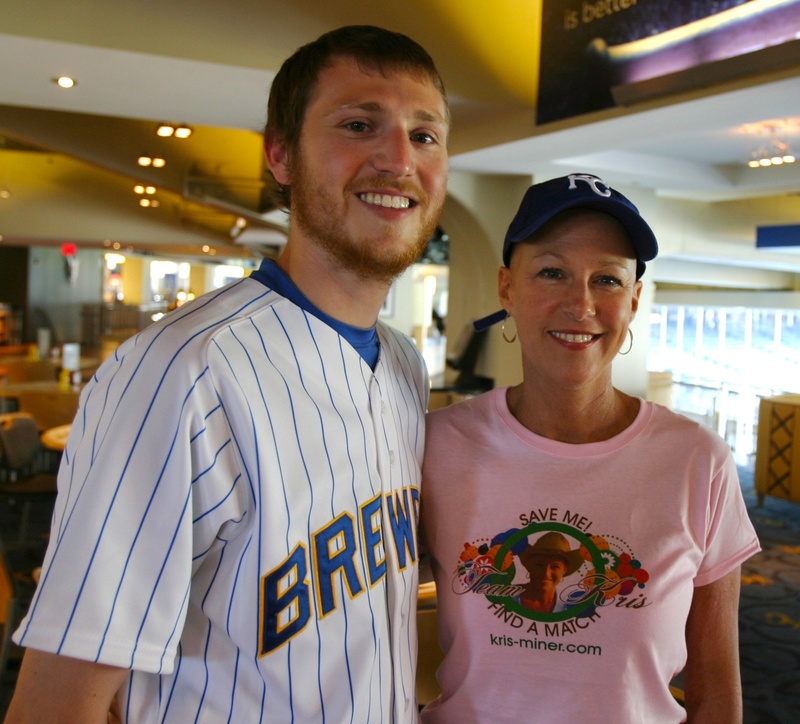 I met Victoria inside Miller Park at 2:20, and we went to section 225 to take game photo number 59. Only 103 games left to go, and it’s going by pretty fast. After getting the picture we decided we wanted food, and we went to the Plaza Pavilion which is the outdoor concession stand near section 110 (first base side of the field level). Victoria got the Milwaukee steak sandwich and I had the brisket smothered bacon dog. Mine consisted of a bacon wrapped hot dog covered in BBQ’d brisket, caramelized onions, diced onions, and cheddar cheese. It’s $8.25 but was worth every penny. It deserves its own category but I’ll be including it in the hot dog count of the stats at the end. 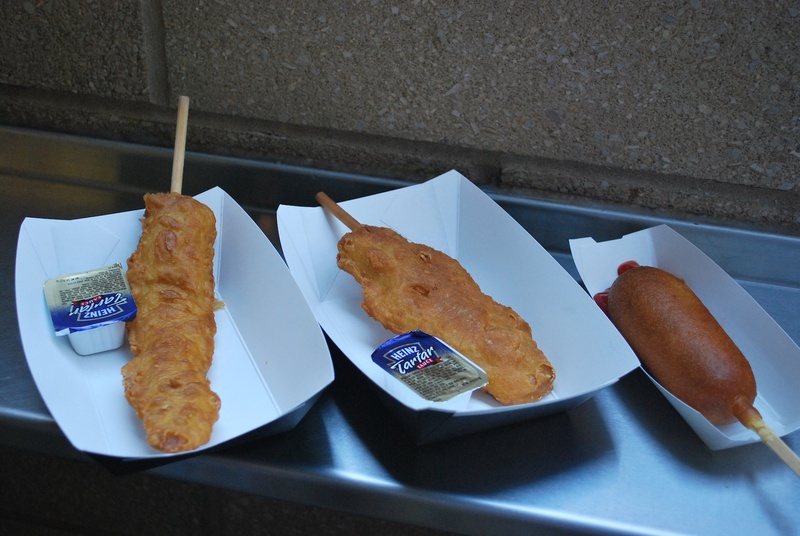 We ate in the cross aisle below the press box so we could stay out of the sun as long as possible. After finishing we went to our seats, and sat down when it was a 2-2 count on the Padres leadoff hitter in the top of the first. 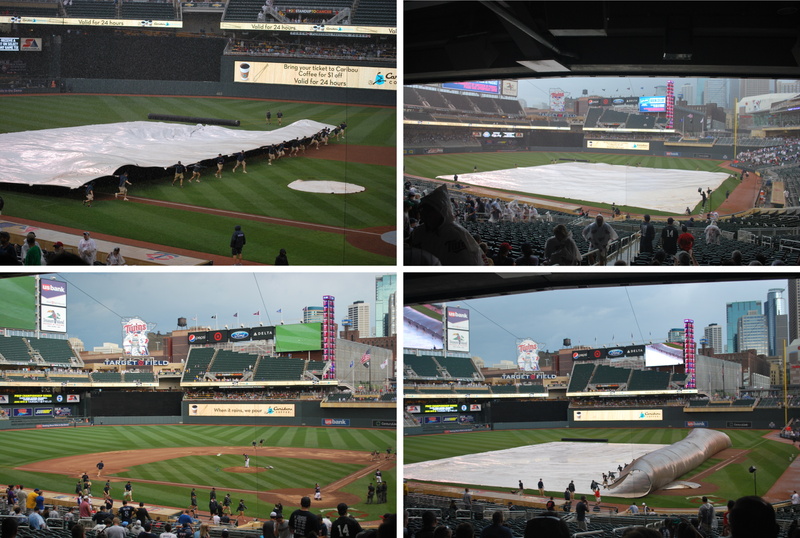 I didn’t miss the first four pitches, and I saw them all as we walked under the press box windows to our seats. 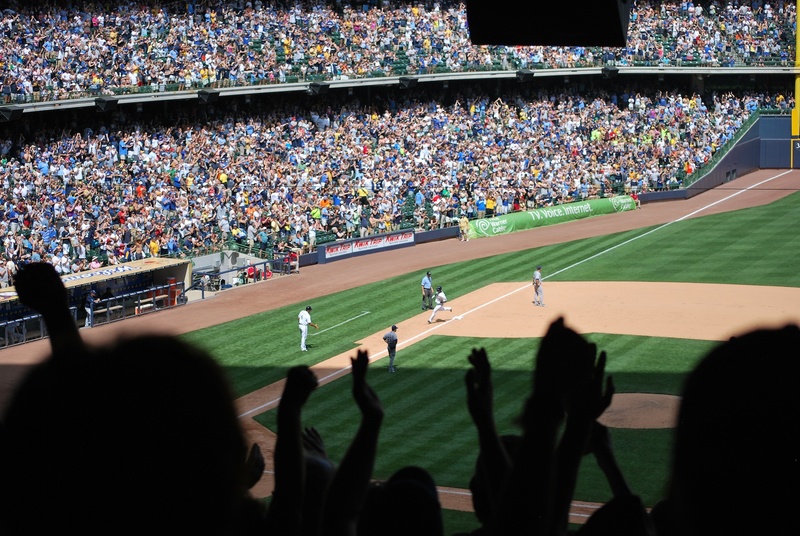 The Brewers got off to another great start, and took a 1-0 lead on an RBI double by Rickie Weeks in the bottom of the first. When Weeks was on second I got a picture of the contraption that he wears on his left hand. As you can see, it resembles an oven mitt. It’s to protect his hand on head first slides, and I think his brother wears one now as well (Jemile Weeks plays for the Oakland A’s). In the top of the third the Padres tied it on an RBI infield single. The Brewers regained the one run advantage in the bottom of the fourth on an RBI single by Maldonado. The Padres came back and scored a run in the fifth, two in the sixth, and another in the seventh. 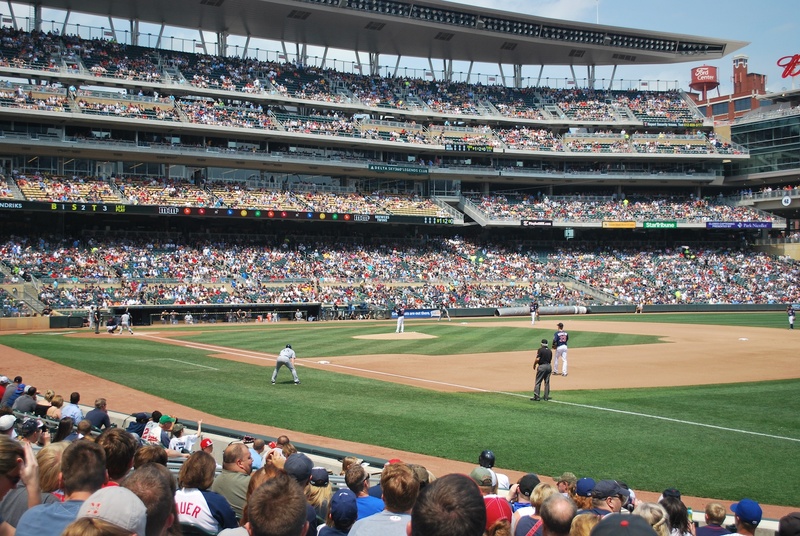 The Brewers failed to score after fourth, and they left a total of 11 on base. Final Score: Padres 5 – Brewers 2. Victoria and I are staying at her Aunt and Uncle’s house in Sussex again, and we were planning on going to a movie but were exhausted after the game. We stopped and got a take and bake pizza from Papa Murphy’s and a six pack of 8 ounce Miller Lite’s. Victoria had wanted a beer with our Gourmet Vegetarian pizza, but the Pick ‘N Save doesn’t sell single beers, and she thought the 8 ounce cans were cute. I will admit that I felt like a giant when I was drinking one, which is just what I needed after the tough loss. It’s supposed to be 90 degrees tomorrow, and in the sun the weather guy said it will feel like over 100. For 1:10 start times our seats don’t get shade until 3:00 or so. Long story short; Victoria and I aren’t going to the game tomorrow. Made you think for a second, didn’t I? HA. We might just watch from the concourse for an hour and then go to our seats so we don’t fry. Before the game on Friday was going to be the last time I’m at my parents’ house in Fort until after the June 18th game vs. the Blue Jays. For this reason I had some packing to do. I had to make sure I had the game number signs for the three games of the Padres series, the three vs. the Royals, three vs. the Twins, and then the sign for the first game of the Blue Jays series. I didn’t *just* need the game number signs, I needed to pack all the essentials as well. Friday actually started with a 7:00 alarm to get ready for a 8:00 am dentist appointment. We’ve reached roughly the midpoint of my age 25 year, and I have yet to get a cavity. This might not seem like a big deal, but it’s one of my proudest achievements. I was planning on replacing my spark plugs on Friday as well, but an Advance Auto Parts worker didn’t understand what I wanted and after the mistake I didn’t have enough time. I won’t get into it but he sold me the wrong stuff when I clearly told him what I needed. 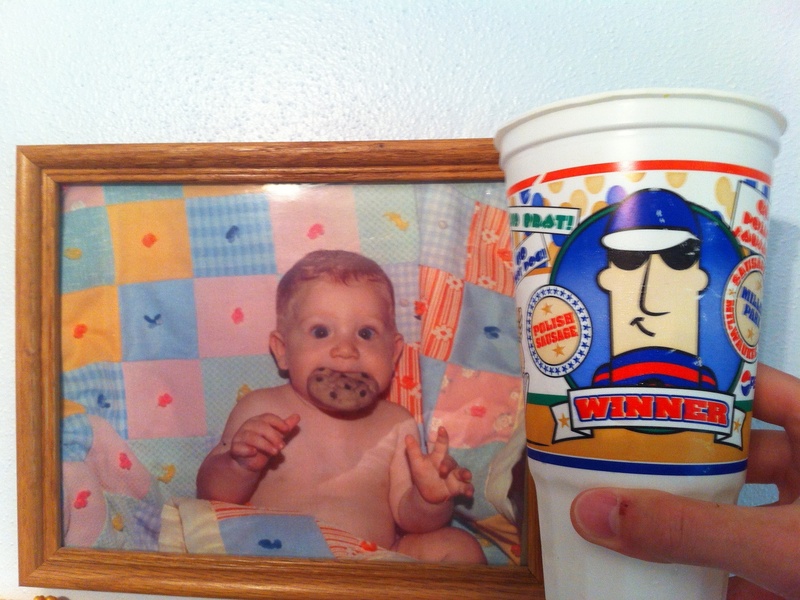 This is some foreshadowing but during the day I found a couple of these cups in my parents’ cupboard. I had forgotten all about them, and must have brought them home from a game back in 2003 or 2004. I can’t remember the last time I had a souvenir soda at Miller Park, so I’m not sure what year they are from. I tweeted the picture later in the day saying “Who would’ve thought that these two would grow up to be such good friends. Pretty good, no? If you’re not aware about my sausage preference; Polish is my favorite. Also, it’s a fake cookie if you weren’t sure. I packed for the Padres series and the road trip and was on the road to Milwaukee at 3:40. After a major backup due to the 894 interchange I got to the Brewers 1 Lot at 4:54, and made my way to the general lot again. I’m trying to get back there more to hand out cards, and a former co-worker was also having a tailgate. After spending 30 minutes or so visiting with strangers I met up with Laura. Her office is actually right next to Pam’s, who joined me for Thursday’s game. Laura asked if I wanted to stop by and tell her friend about what I was doing. When I started he chimed in and said he had heard about it, but that someone else was on the quest with me. I disagreed but he was pretty sure. Finally he admitted that maybe it was a dream or something. I had Laura’s husband take a picture of the two of us before taking off. 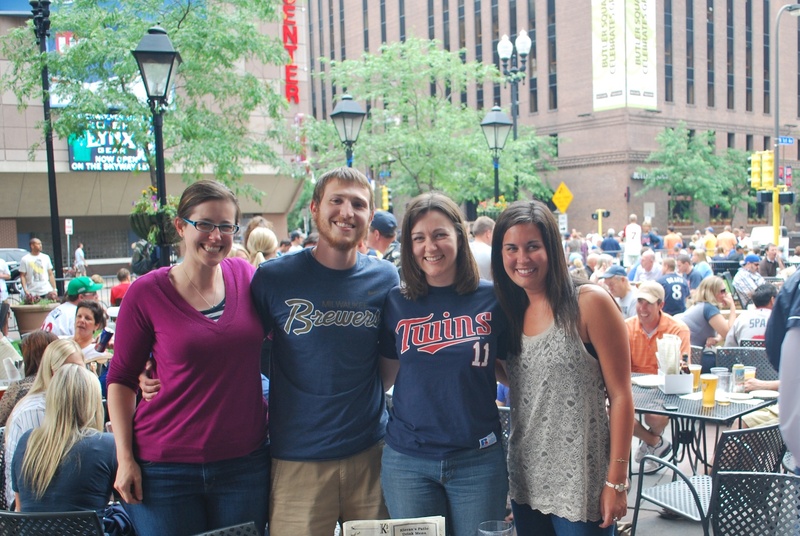 I’ll be going to the June 20th game with another former co-worker, Steve, and it’s nice to see some familiar faces. It’s also nice that they don’t hate me for quitting on them when the office was about to get hectic with a bunch of work. I stopped by one more tailgate before making my way in, and I’m glad I did. I think they had about 10 people in their tailgate, and they were all in their early twenties. Like I said before I’m encouraging the younger population to join the registry and the older population to donate money, because Be The Match needs both. I do emphasize that both are equally important. 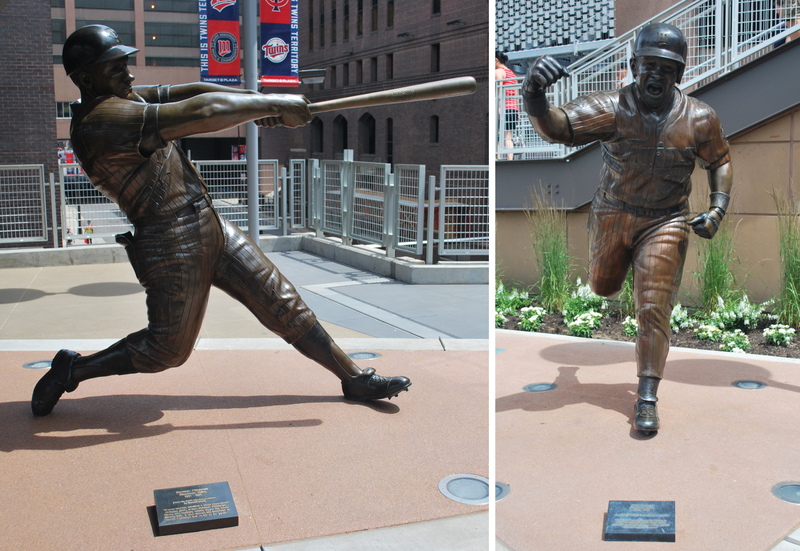 When I was nearing the bridge over Miller Park Way I came across these guys. 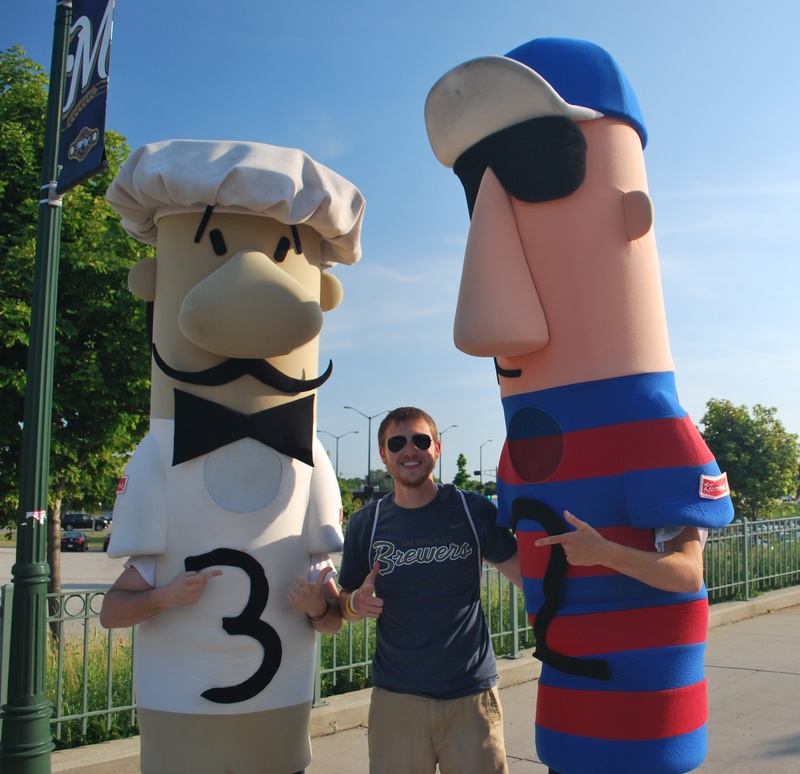 I debated asking the Italian to stay out of the picture because I dislike Italian sausages, but decided against it. I also debated doing a thumbs down with my right hand and a thumbs up with my left, to show my disdain and appreciation for the respective sausages. Instead I went with the pistol for some reason (don’t ask why, I don’t even know). 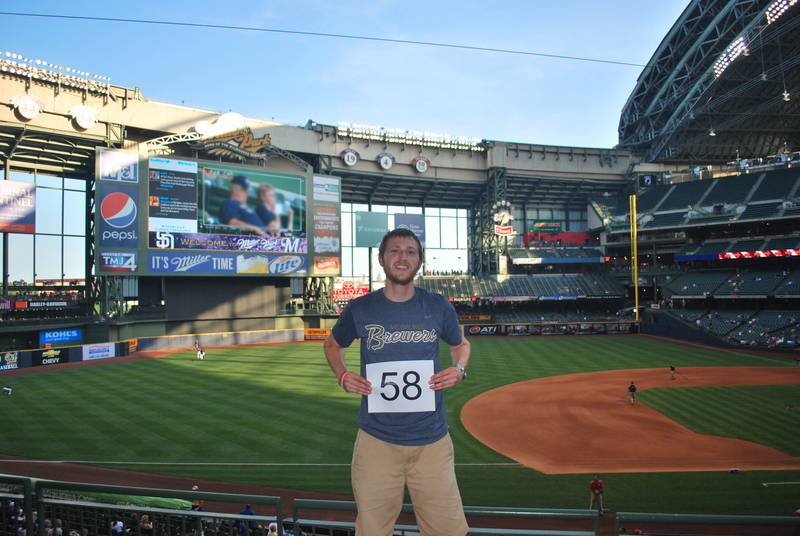 I got inside Miller Park just before 6:15, and went right to section 226 to get game photo number 58 taken. A nearby fan helped me out, and took three or four pictures, with me instructing him of what I wanted between each one. He did a great job and I thanked him for his efforts. I had listed my ticket on Twitter again, and a friend from high school met me at the game and agreed to donate $30 to Be The Match. His name is Jason as well, so that means the last three guys that have joined me at games are all named Jason. We actually spotted each other in the concourse before either of us told the other one that we were inside. We stopped by the Ice Man for a minute and Jason bought an MGD for himself and one for me. Thanks Jason! We made it to our seats with time to spare and talked baseball and fantasy baseball (we’re in the same league). I’m the commissioner and I really haven’t had time for my team this year but somehow I still have a 4-4 record (we do head-to-head). The game got underway and it began with some fireworks for the Crew, literally. Corey Hart went deep leading off the bottom of the first which set off the fireworks as he rounded the bases. 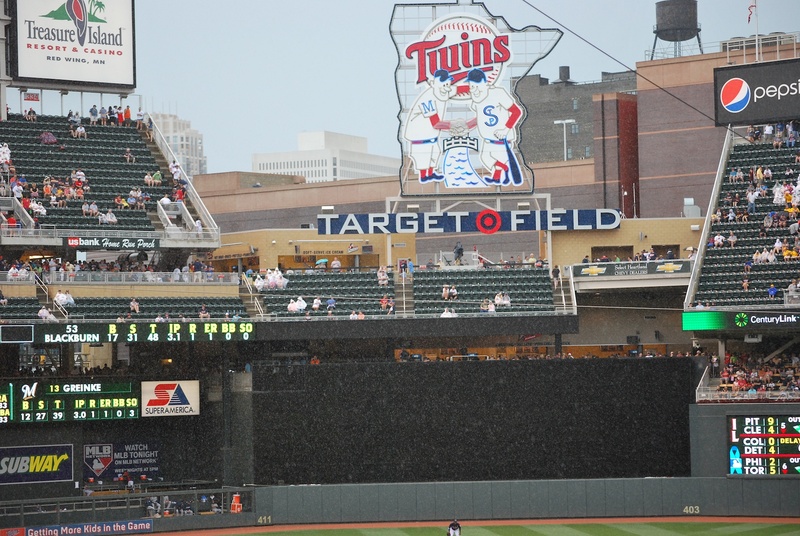 The Padres tied it in the fourth when Carlos Gomez dove for a ball in front of him, and it rolled to the wall. Cabrera had a (gift) inside-the-park home run and didn’t even need to slide into home. I still don’t know why that can’t be considered an error. It wasn’t an error because he didn’t catch it, but the fact that he let it get all the way to the wall should make it a single and a three base error. Marcum worked out of some trouble in the 4th, despite walking in a run. The bases were loaded with only one out, but the one that he walked in was the only run to score in the inning. In the bottom of the fourth, and right before the Maldonado at bat Jason said that he was going yard. Second pitch of the at bat: It’s a Bingo! That’s an Inglourious Basterds reference. It almost looks like Maldonado hit Sedar’s hand so hard that he dislocated his shoulder. I like that you can see the fireworks, and a fan clapping in the foreground. It’s either that or she’s saying how big the fish was that she caught (I’m not impressed). Green is making his way past Sedar and Ramirez is nearing home plate. Earlier in the game I had tried to get Norichika Aoki doing his at bat routine, but the catcher was returning from the mound and ruined it all. Luckily for me (and you) he came back up in the bottom of the eighth. I’ve said that he looks like he’s doing a sumo routine or something, and that has nothing to do with the fact that he’s Japanese. It just looks like it, doesn’t it? You could also argue that there’s an ant hill next to the plate, and he’s debating on if he should let them live, I guess we’ll never know. 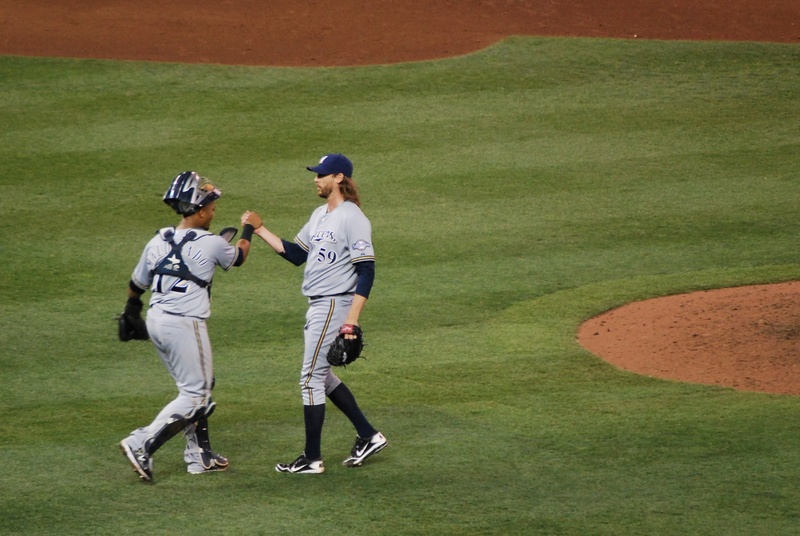 The Padres added two meaningless runs in the ninth inning, and the Brewers won. Final Score: Brewers 9 – Padres 5. 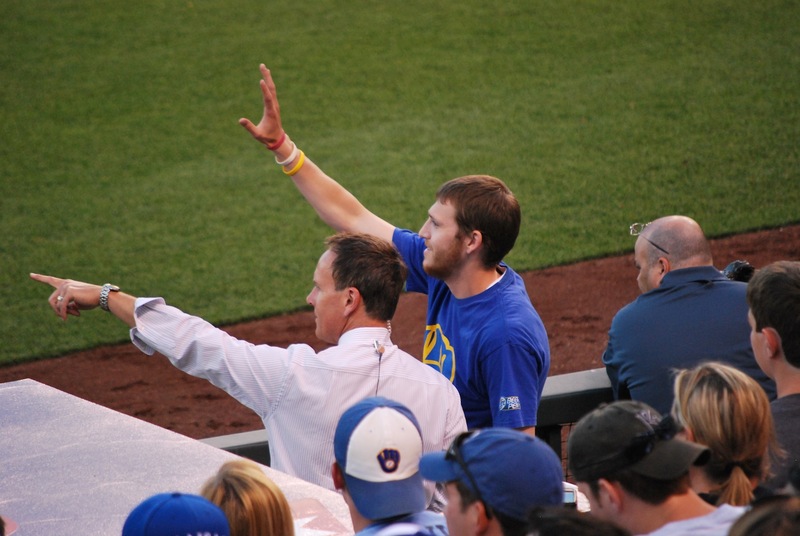 During one of the half innings I had a fan behind me take a picture of me and Jason number three. She has a twenty game pack and I cannot for the life of me think of her name. She reads the blog so now she’ll know, but I’m not 100% sure that she’s ever told me. I had a great time with Jason and it was cool catching up. Now if only all of his fantasy baseball pitchers could start getting shelled 24/7, it would be a perfect world. It’s 2:24 am as I finish up this post, and I’ll be leaving in about eight and a half hours for game number two of the series. I don’t know why Saturday’s game is at 3:10, but that’s the way it worked out. It was a quick turnaround between Wednesday’s and Thursday’s games, and I met Pam in Johnson Creek at just before 11:00 am. Pam works at Tetra Tech in Madison. 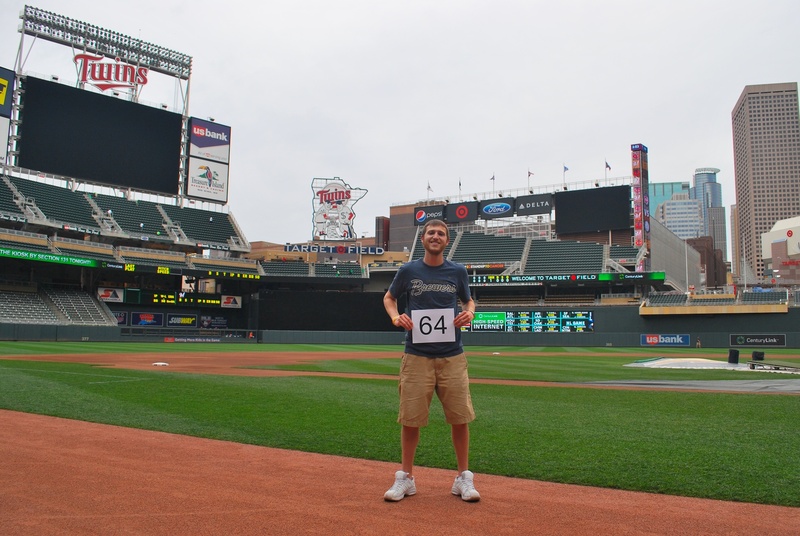 We were co-workers for the 14 months that I was employed before beginning my 162 game adventure. She reads the blog, so she probably won’t like hearing this, but she was sort of a motherly figure while at work. She’s really cool though and I promised that I would take her to a game at some point during the season. I might just have to take her to another game seeing because of how well the day went. If you read the blog on a regular basis you may remember me mentioning Pam before. She was the one who (famously) said “that’s f****** awesome!” when she saw me for the first time after hearing about what I was planning on doing. We pulled into the Cooper 1 Lot at 11:49, and made our way inside. We went to section 227, and Pam took game photo number 57. I gave her instructions and she got the job done. Thanks Pam! 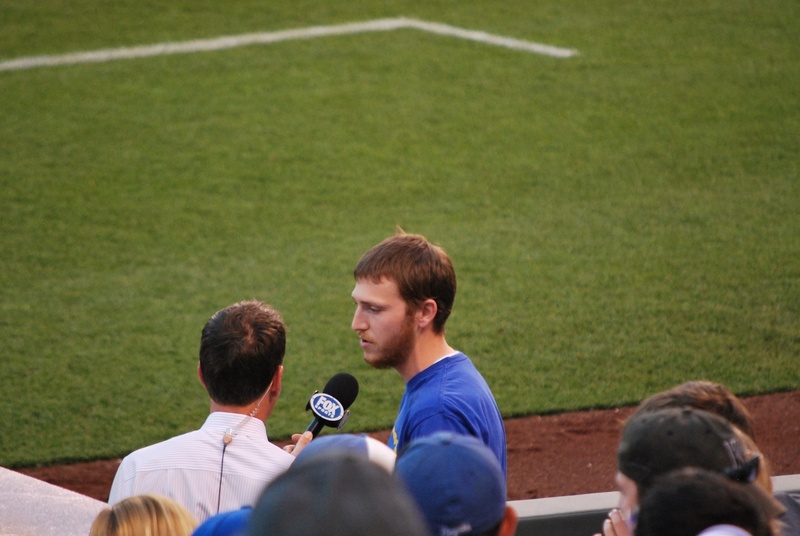 During Wednesday’s game Adam DeCock stopped by for an interview. We had walked back to the cross aisle in front of the press box and my back was facing the wall directly under the press box. Adam then stood in front of me and I realized his voice recorder was also a video recorder. I was surprised and stepped aside and at first was like “Whoa whoa whoa, what’s going on?” I told him that I was expecting just a audio interview, and that I don’t really miss pitches, so we’d have to figure something else out. I wasn’t mean or anything, and it wouldn’t have been a great interview anyways with all the background noise from the game and whatnot. We agreed to do the interview on Thursday, and we wound up going to the service level of the stadium and doing the interview in one of the media rooms where they film player interviews sometimes. 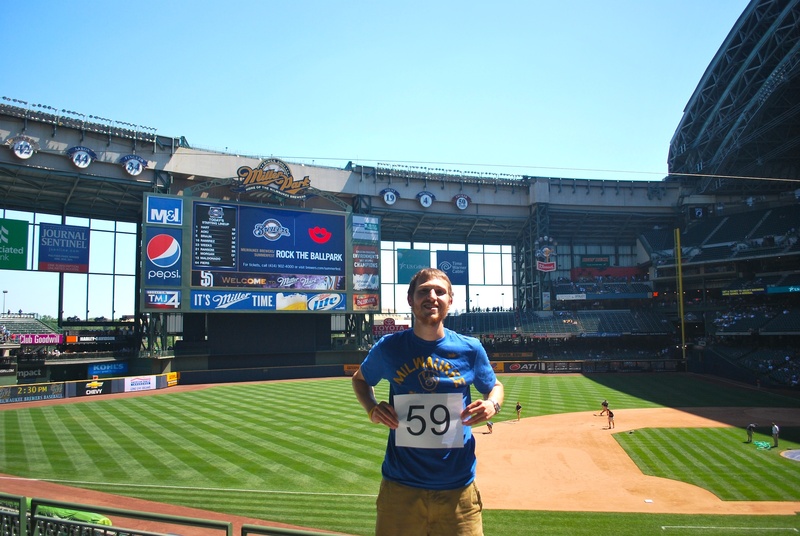 Adam is a MLB correspondent for the Milwaukee Brewers and was doing the interview for Cut4, which is a fan website than MLB created where people like Adam upload videos and other noteworthy articles. I don’t know when it will go up, but it should be within the next week or so. After the interview Pam and I went to hi to the Ice Man. With the way he was saying “she must be proud of you” I realized he thought she was my mom. I told him that Pam wasn’t my mom, but that she did look somewhat similar to my mom, so I gave him a pass. 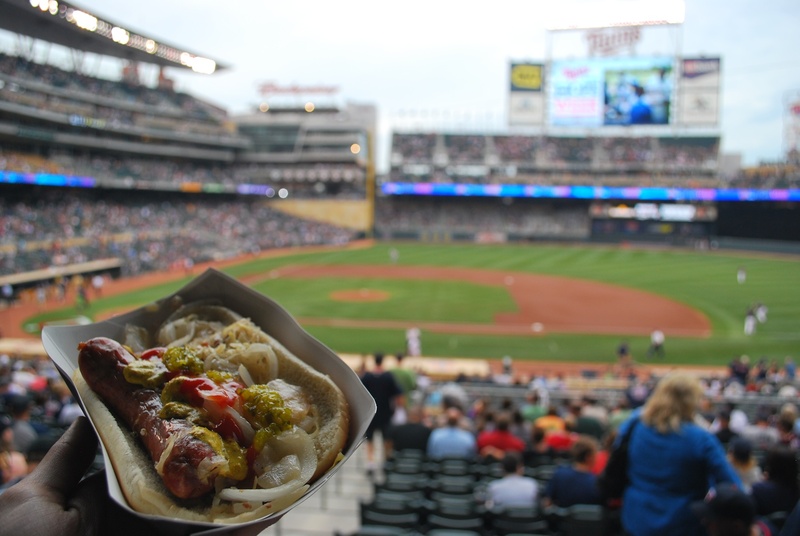 We then stopped at a concession stand for beers and bratwurst. Well, Pam got a Brat, I got a Polish. 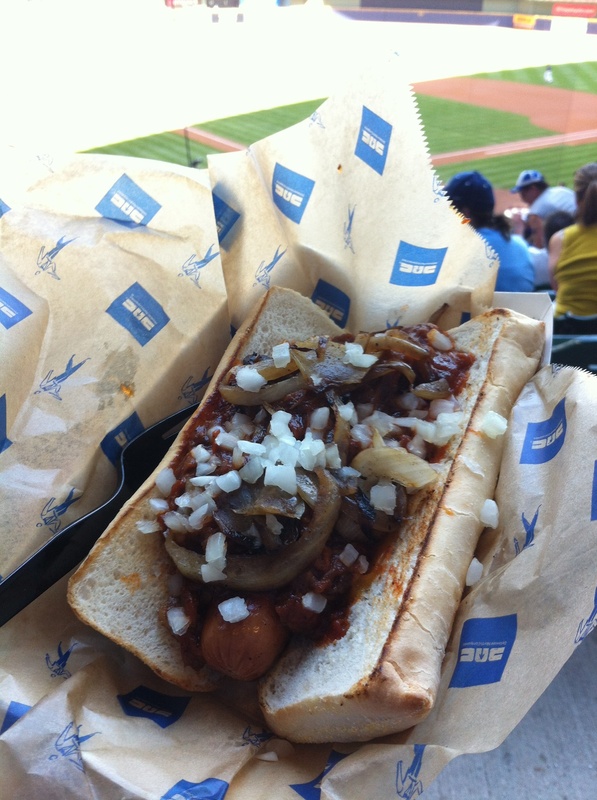 I’ve had four or five Polish sausages at Miller Park this year and I kept forgetting to ask for sautéed onions, which are free of charge. I didn’t forget on Thursday and it added to the Polish’s deliciousness. 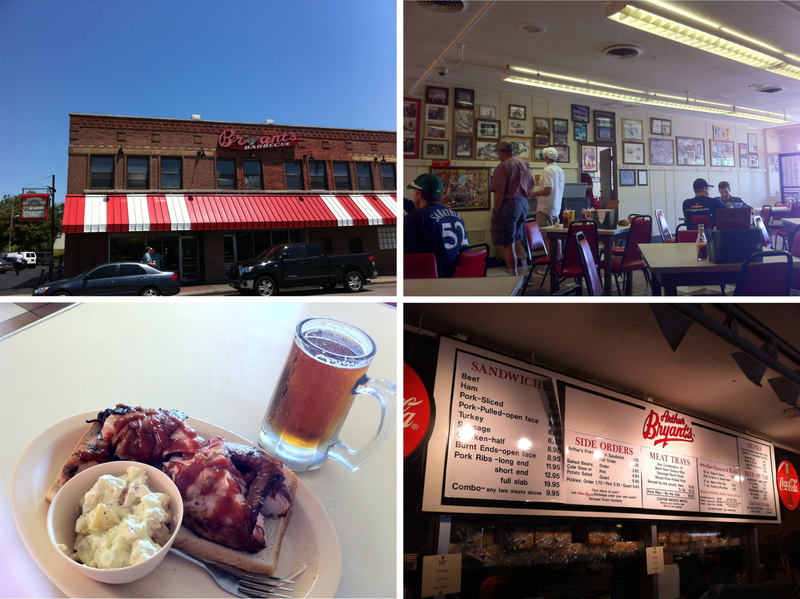 We said hi to Bill, and then ate our respective encased meats below the press box in the cross aisle (out of the sun). Since I knew we’d be in the sun for almost two hours before the roof provided some shade I figured we should minimize our time in the sun. We got to our seats with a few minutes to spare and got situated for the game. The first nine Brewers that came to the plate went down in order, but through three innings the Cubs had no runs to show for their three hits, so it was knotted at zero. 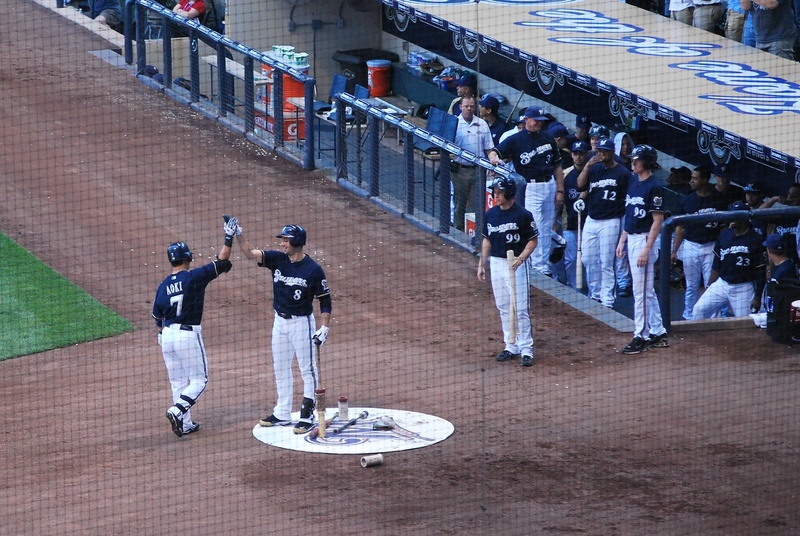 Norichika Aoki broke the tie with his first over the wall home run of the year. 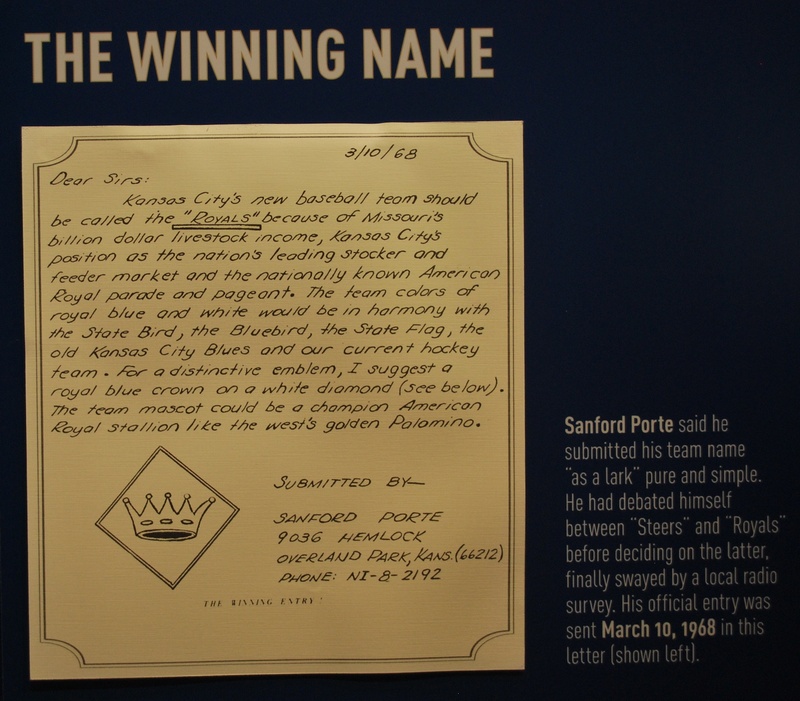 He had an inside the park home run on April 20th, in just his 12th major league at bat. His home run in the fourth barely cleared the right field fence, but I’ll take the cheapie. 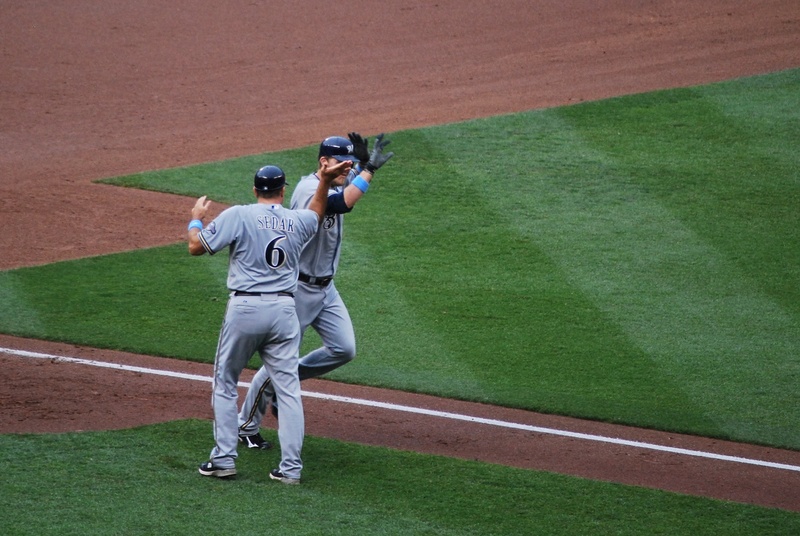 Here’s Aoki getting a high five from Braun after his homer. 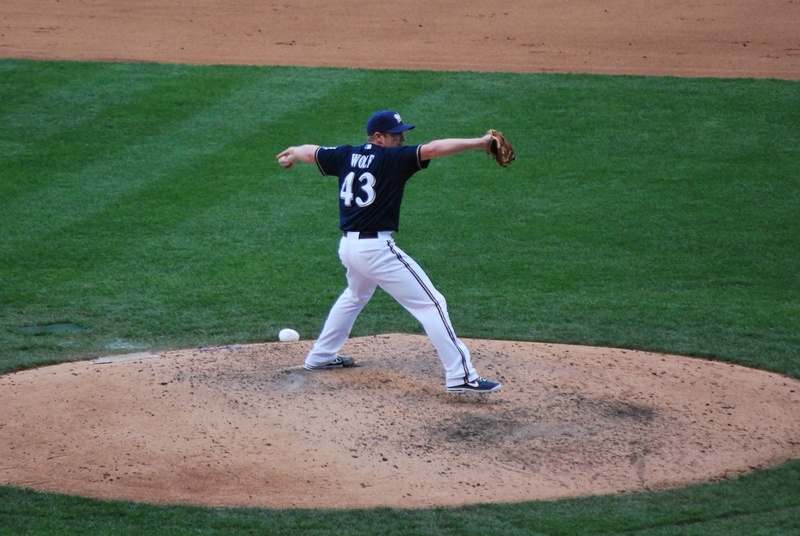 Randy Wolf was the starter for the Brewers, and he definitely deserved the win. He pitched six and two thirds, giving up one run on four hits and two walks, while striking out six. 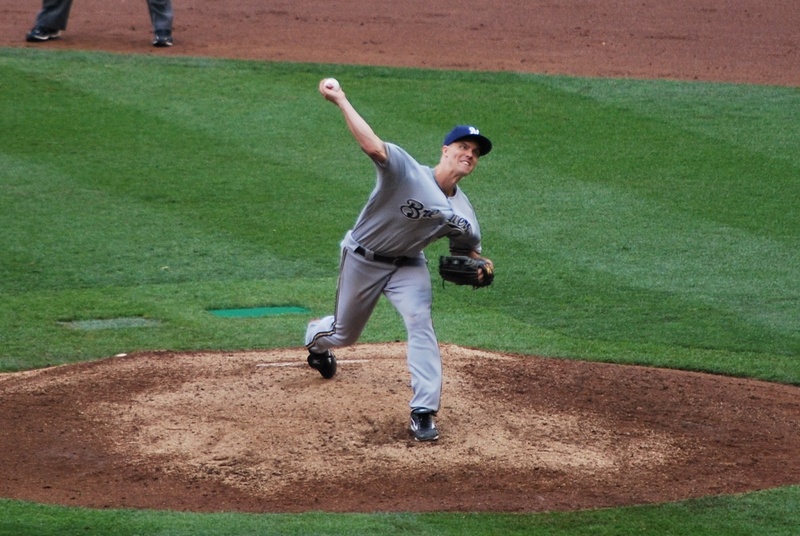 Greinke and him must have a bet going as to who can throw the slowest pitch. I think Greinke had hit 55 mph earlier in the year, but Zack outdid himself on Wednesday with a 53 mph curveball (a “slowball” at that speed). Wolf tried to match it but he couldn’t, bottoming out at 56 mph on Thursday. 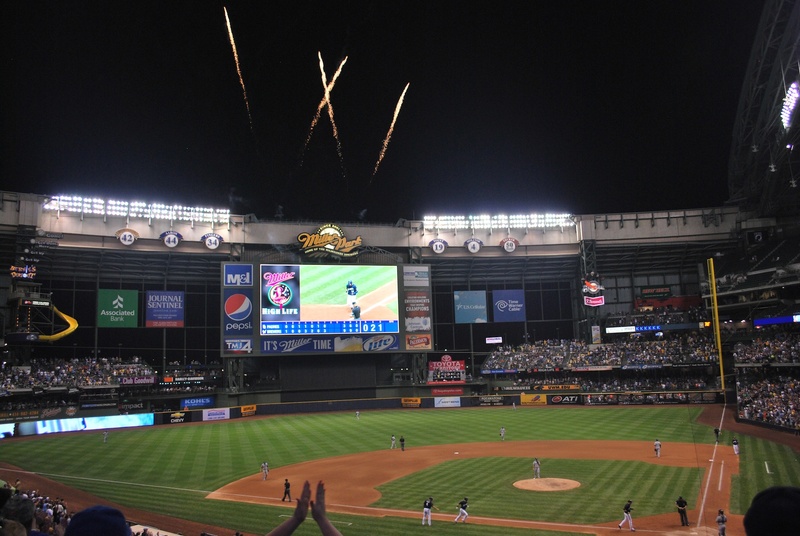 The Brewers scored a run in the bottom of the sixth on an RBI single from Kottaras and held the 2-0 lead going into the seventh. An RBI double by Koyie Hill got the Cubs on the board and cut the lead to 2-1. In the top of the eighth inning K-Rod retired the first two batters then gave up a single to Soriano. Bryan LaHair pinch hit for the Cubs, and I was telling Pam that he’s probably their best power threat, and what’ya know; he went deep to give the Cubs a 3-2 lead. In the bottom of the eighth the Brewers answered when Chart hit a two-out RBI double to tie the game at three. 1) His Brewers teammates preparing to mob him at the plate. 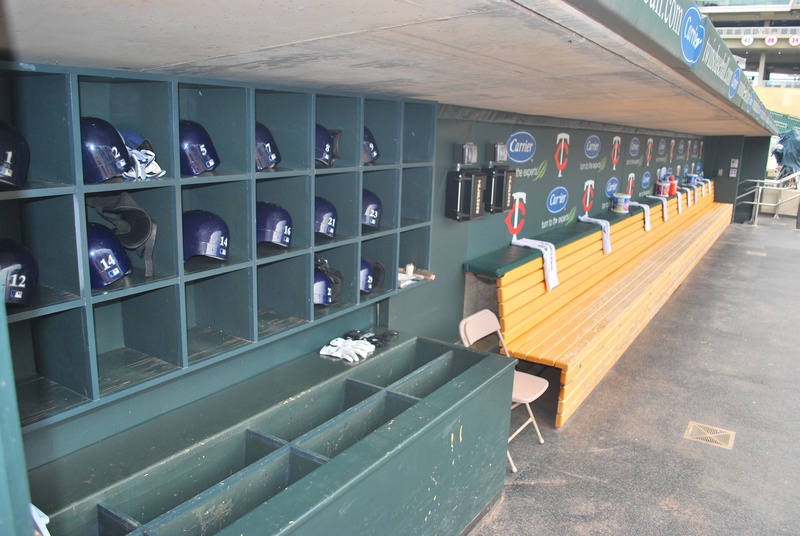 I cropped it a little but made sure to leave the Cubs catcher in the frame. 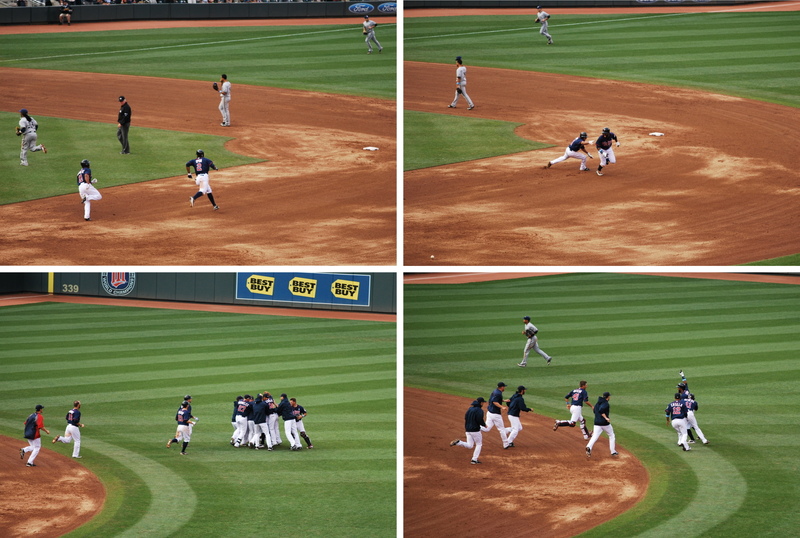 It’s a walk off, so it wouldn’t be right to show it without somebody on the losing team walking off the field. 2) Aoki just after he ceremoniously flipped his batting helmet. 3) Aoki going airborne (while his helmet floats mysteriously above the dirt). 4) Party time! 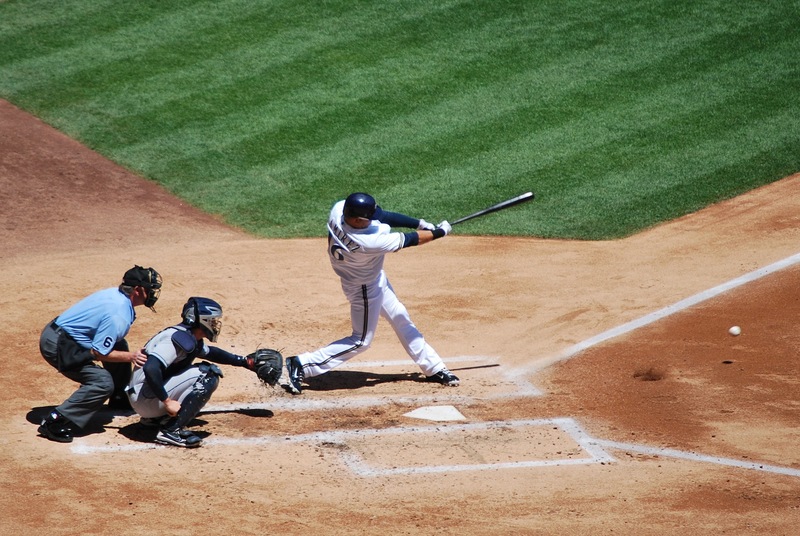 If you click the image you can get a better look, but Aoki’s right foot is just about to touch home plate. The home plate umpire is watching closely, to make sure Aoki touches home. Final Score: Brewers 4 – Cubs 3. It was a great ending to a hard fought game. When K-Rod gave up the two runs in the eighth I told Pam that before Thursday’s game the Crew had never lost a game that they had led going into the eighth since K-Rod joined the team. I thought for sure it would’ve been the end of that streak, but Chart and Aoki came through and got the job done. Before the eighth inning started I had a fan a few rows in front of us take a picture of me and Pam. You can just barely make out Pam’s eyes due to her hat, but I promise it’s her. I rarely wear hats, but since I knew we were going to be in the sun for two hours I brought my hat along. 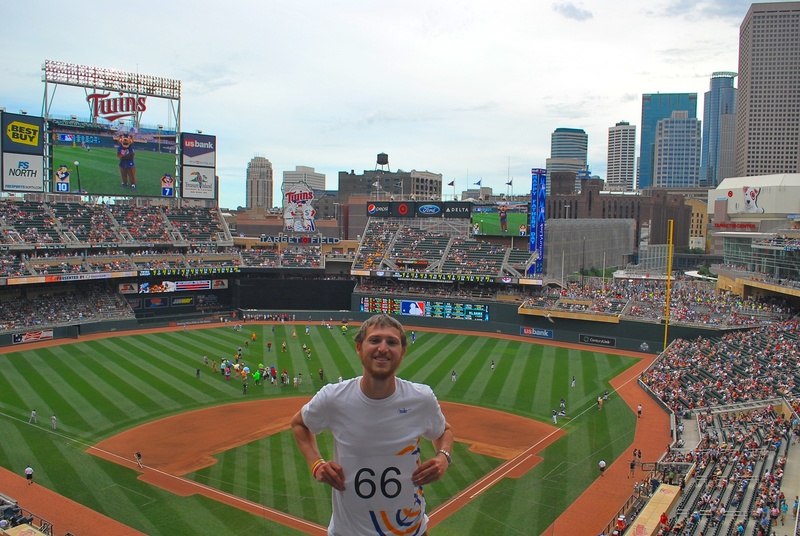 We were in the shade by 3:00, but once I wear a hat and get a little sweaty, I can’t go back to no hat. If I took it off it would’ve looked like a combination of two or three Alfafas from the Little Rascals, and a matted down lawn. I almost forgot the funny fan moment of the game. In the top of the ninth when Campana came to the plate a Cubs fan (in his 60s) said: “Use your wheels, chop one to short[stop].” On the very next pitch Campana did just that, and was subsequently thrown out by Edwin Maysonet. I looked back at the guy and heard/saw him tell his friends: “Well…. he’s fast.” Good stuff. Friday is the opener of the Padres series, and the first game of the last series of the home stand. This is the last nine game home stand, so the remainder of the season will consist of the three, six, or seven game variety.